The Evidence Communication Innovation Collaborative (ECIC) of the Institute of Medicine explores ways to improve the communication and understanding of evidence important to decision-making in health care. Central to this discussion has been the notion of “shared decision making” (Terms that appear in italics are defined in the glossary at the end of this paper. ), a term first used by the 1982 President’s Commission for the Study of Ethical Problems in Medicine and Biomedical and Behavioral Research to underscore the key role of patients in the decision process. It has been more than 30 years since the President’s Commission urged the adoption of shared decision making (SDM) as a means to reform physician-patient communication and to improve the day-to-day implementation of meaningful informed consent to medical treatments. There is insufficient access to high-quality patient decision aids, tools that can help provide patients with needed information about treatment alternatives across relevant conditions (Légaré et al., 2012). With all these barriers, it might not be surprising that three decades after the President’s Commission report, the promise of SDM remains elusive. The principles are espoused, but practice lags behind, despite the development of numerous patient decision aids and other efforts to promote the process of SDM. 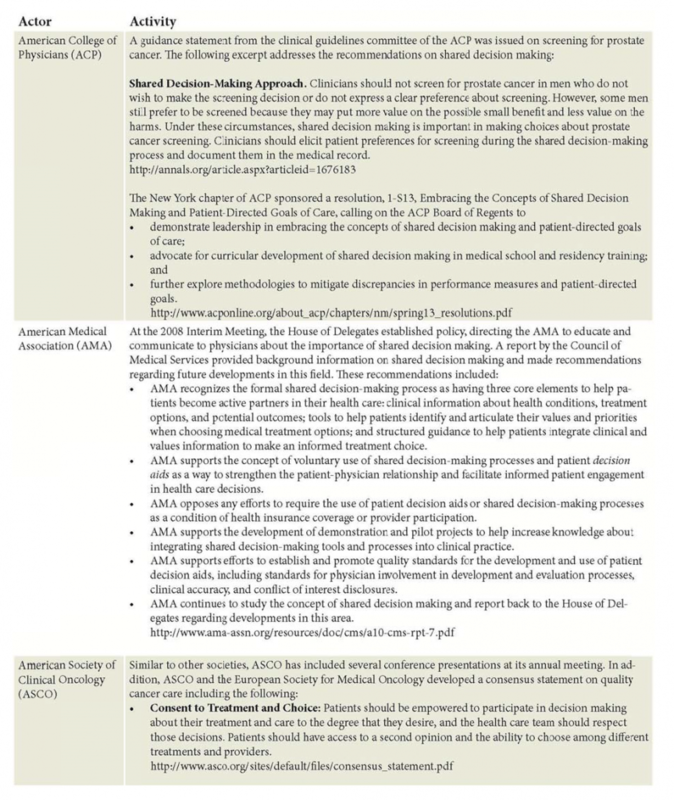 This discussion paper seeks to stimulate action toward embedding SDM—which has been called the “pinnacle” of patient-centered care—into clinical practice. As such, the authors focus particular attention on the need to ensure the quality, integrity, and availability of patient decision aids, though we recognize that SDM requires not just the use of a tool—it will also require the deployment of skill sets, attitudes, infrastructure, policies, and systems that fully support the meaningful patient-clinician conversations necessary to arrive at truly shared decisions. In this regard, we discuss a variety of interesting and important questions about decision aids and SDM, but space and time constraints preclude us from covering them in depth in this paper. For example, we mention but do not dwell on the need for further study about potential risks and benefits of implementing SDM, such as the possible effects of SDM on disparities and cost-effectiveness. We do not detail the pros and cons of decision aids used in the office compared with at home, or online versus in person, or the roles of families, friends, or online communities in SDM. Perhaps most important, still to come is a detailed roadmap for training the current and next generation of clinicians so that they will see conveying understandable information, eliciting patient preferences and values, and sharing decisions with patients as the norm. Rather than emphasizing these questions and issues, our aim is to suggest a set of concrete actions that could help break the logjam and facilitate implementation of patient decision aids as a routine part of clinical practice. Supporting patient engagement and effective self-care through strong bidirectional clinical communication has deep roots in health care ethics, but recent decades have witnessed remarkable changes in how communication and patient empowerment have been interpreted and implemented in practice (Wynia, 2012). In some arenas, there have been transformational changes in how clinicians and patients interact, with a notable shift from medical paternalism to the clear call for more patient autonomy. The activities of the HIV/AIDS community, breast cancer advocacy groups, and the right of families to access the delivery room (and virtually every other area of the modern hospital) are but a few examples of patients and caregivers seeking a greater role with their clinicians in how health care decisions are made (Joint Commission, 2011). Along this evolutionary path, the notion of SDM has emerged as a key aspect of patient-centered care and a powerful way to transform the conversation regarding clinical treatment choices. As noted in the introduction, the term “shared decision making” did not arise from the medical community; rather, it appears to have been coined in a report in 1982 by a diverse group of scholars from the disciplines of law, medicine, and bioethics. The President’s Commission for the Study of Ethical Problems in Medicine and Biomedical and Behavioral Research, appointed by Congress and President Carter, examined, among other issues, the ethical and legal implications of informed consent in health care (President’s Commission, 1982). The Commission noted that, starting in the 1950s, following World War II, the ethical principle of beneficence (providing net medical benefit to patients) had been ceding ground to the principle of individual patient autonomy, as reflected in case law on informed consent in all 50 states. Although the notion of consent to medical treatment has a long history in Anglo-American law, by the 1980s U.S. courts had recognized widely that patients must be specifically informed of the potential harms, benefits, and alternatives of proposed medical interventions in order for “consent” by the patient to the proposed treatment to be “informed” (King and Moulton, 2006). This legal requirement was grounded both in the fundamental individual right not to be touched without consent and in the professional duty of clinicians to serve the interests of patients (i.e., professional negligence, or malpractice, related to the “duty to warn”). Today, to satisfy the legal requirements of informed consent, a clinician must share with the patient the severity and probability of potential harms and benefits of various alternative treatments (King and Moulton, 2006). Nevertheless, state laws are not uniform and have developed two standards for informed consent. The first is the physician-based standard, in which the practitioner is required to disclose the information about harms, benefits, and alternatives that a “reasonably prudent practitioner” would under like or similar circumstances disclose. The second is the patient-based standard, which requires that the provider disclose information about the harms, benefits, and alternatives that “a reasonable patient” would want. Building on the work of Jay Katz of the Yale Law School, the President’s Commission proposed a third option, that of SDM (President’s Commission, 1982). As Katz wrote: “No single right decision exists for how the life of health and illness should be lived. . . . Physicians and patients [each] bring their own vulnerabilities to the decisionmaking process. Both are authors and victims of their own individual conflicting motivations, interests, and expectations. Identity of interests cannot be presumed. It can only be established through conversation” (Katz, 1984). Experience over the last three decades has confirmed what the President’s Commission had proposed, that is, that neither of the traditional legal standards for informed consent can pass muster (King and Moulton, 2006). The physician standard overlooks the fact that physicians do not practice in a uniform manner, and the patient standard overlooks the fact that individuals have differing preferences and value potential harms and benefits differently (Wennberg, 2010, 2014). And both standards are flawed in that they see the process of informed consent as fundamentally a one-way information delivery scheme—the only question being how much information needs to be delivered from every like clinician to every like patient. Moreover, as currently practiced, informed consent frequently results in neither adequate information delivery nor meaningful consent to the proposed plan of care (Krumholz, 2010). Too often, the process of consenting is seen as acquiring the patient’s signature on a form and not the robust communication required for meaningful deliberative decision making. SDM goes beyond an inflexible view of informed consent by encouraging patients to become informed and empowered, according to their individual preferences, so they can engage in constructive discussions with health care practitioners. At the heart of SDM is the ethical imperative of respecting the informed preferences of individual patients, even when they differ from the preferences of the average patient, the average practitioner, or the particular practitioner making a treatment recommendation (Moulton and King, 2010; Elwyn et al., 2013e). Through an interactive process of reflection and discussion, the clinician(s) and patient reach a mutual decision about the subsequent treatment or testing plan. Since research has shown that extemporaneous conversations with clinicians often do not result in the effective exchange of reliable, complete, and balanced information, a structured tool can often enhance information exchange to support the process of SDM. When Should SDM Be Pursued? There are a few treatment decisions, such as whether to set a broken arm, for which there is such incontrovertible evidence of benefit and so few downsides, that clinicians and patients would be almost unanimous about what to do. While some have sought to limit the application of SDM to preference-sensitive decisions, this distinction is difficult to define and challenging to apply in practice. and lifestyle choices for such chronic conditions as diabetes or high blood pressure. What Is the Role of Decision Aids? One way to promote SDM is to provide patients and clinicians with well-designed and structured decision aids, which are tools intended to provide detailed, balanced, evidence-based information about competing treatment options. In sum, while patient decision aids can help patients become better informed, and being informed may help patients engage with clinicians, ensuring that patients are informed does not necessarily ensure that patients are invited to “share” in the decision making process, or that their preferences are respected. The best decision aids, therefore, provide information and also encourage patients and clinicians to get on the “same page” with regard to options, evidence, preferences, values, and plans. Unfortunately, the principles and practice of SDM have not grown as rapidly as the Commission had hoped. In surveys of patients and physicians conducted for the President’s Commission in 1982, physicians were asked to define informed consent extemporaneously. Fifty-nine percent said it meant informing patients about their condition and treatment, and 47 percent said it included disclosing potential risks. But, the Commission noted, “only 14 percent mentioned treatment alternatives and only 9 percent indicated that informed consent had something to do with the patient making a choice or stating a preference” (President’s Commission, 1982). Moreover, observations and interviews by the Commission raised concerns that, as practiced, informed consent had become a ritualistic signature on a form. The Commission noted that some progress had occurred (“Compared with previous studies, the current results demonstrate a clear sense of physicians’ responsibilities for making disclosures and reaching mutual decisions.”) but added that much more was needed, and the Commission wished “to promote a fuller understanding by patients and professionals of their common enterprise, so that patients can participate on an informed basis . . . in making decisions about their health care” (President’s Commission, 1982). Recent studies suggest that deficiencies in informed consent persist. For example, Dillard and colleagues found that 35 percent of men who perceived themselves to be at high risk for cancer would like to be more involved in screening decisions (Dillard et al., 2010). A second analysis of the same data set also found that, for each of nine common medical decisions, between 30 percent and 84 percent of patients reported having been asked about their preferences before a decision was made (Zikmund-Fisher et al., 2010). A recent study conducted by participants in an Institute of Medicine Collaborative reported that fewer than half of patients reported having a practitioner ask about their goals and preferences (Alston et al., 2012). The next section of this paper explains in more detail the evidence demonstrating that SDM remains an elusive aim for far too many patients, but we note here that embracing SDM as a routine part of clinical practice should not wait another 30 years. We hope this paper will provide a roadmap for progress, and underscore its importance. Clear and consistent research shows that most people want to be informed and involved in decisions about their medical care. In a recent review of 115 studies of decision-making preferences for treatment and screening, the majority of respondents preferred sharing decision roles in 71 percent of the studies from 2000 onward, compared with 50 percent of studies prior to 2000 (Chewning et al., 2012). And, in a systematic review of optimal matches of client preferences about information, decision making, and interpersonal behavior, findings from 14 studies showed that a substantial number of patients (26 percent to 95 percent, with a median of 52 percent) would have preferred to play a more active role in decisions concerning their health and were dissatisfied with the information they were given (Kiesler and Auerbach, 2006). A recent paper indicated that “when questions are worded such that patients understand that they are not being asked to make decisions requiring technical clinical information, when questions are worded in formats other than agree-disagree, and particularly when respondents have been given basic information about the decision they are facing, survey data are extremely consistent; most patients want to be informed and to play a direct and active role in the decision making process” (Fowler, 2011). (3) knowledge of the patient’s and family’s preferences (goals and concerns). People desire a patient-centered experience. 8 in 10 people want their clinician to listen to them. 8 in 10 people want to hear the full truth about their diagnosis. 7 in 10 people want to understand the risks of treatments. There is a gap between patients’ desire for engagement in health care decisions and what they say is actually happening in clinics and hospitals across the country. 8 in 10 people want their health care provider to listen to them, but just 6 in 10 say it actually happens. Fewer than half of people say their clinician asks about their goals and concerns for their health and health care. Patients whose clinicians listen to them, elicit goals and concerns, and explain all of the options, among other things, are three to five times more satisfied with their clinicians. While engaging patients in their own medical decisions can lead to better health outcomes, previous research has found that people often have poor knowledge of key facts about important health decisions they make, and there are important differences between what clinicians think patients should know, what patients want to know, what patients think they know, and what patients actually know (O’Connor et al., 2004, 2007; Schoen et al., 2007; Lee et al., 2010a, 2010b; Simon et al., 2010; Zikmund-Fisher et al., 2010a, 2010b). A qualitative study using focus groups found that many patients believed that efforts to ask questions and provide opinions were not welcomed by practitioners. Specifically, patients worried that physicians might view engaged patients as being difficult customers and that they might suffer lower levels of care and attention as a result (Frosch et al., 2012). Two studies in the 1990s of tape-recorded physician-patient interactions around decisions found most did not come close to meeting standards for SDM (Braddock et al., 1997, 1999). More recently, a review of 33 studies using the Observer OPTION instrument has shown similarly low levels of SDM in a wide range of clinical settings (Couët et al., 2013). A broader, more representative look at decision making in 2007 came from a national survey of adults 40 or older who were asked about their experiences when they considered at least one of nine medical decisions involving medications, surgery, or screening. The study found that health care practitioners made a recommendation 8 out of 10 times and that the clinician recommendation most often favored the intervention—in approximately 90 percent of medication decisions, 65 percent of elective surgery decisions, and 95 percent of cancer screening decisions. Patients also reported that they were not routinely asked about their preferences. Patients’ reports of practitioners’ elicitation of their preferences was lowest for cancer screening (about 40 percent of the time) and highest for knee/hip replacement surgery (80 percent of the time). Patients considered that health care practitioners nearly always discussed the “pros” of the intervention (more than 90 percent of the time) but infrequently discussed the “cons” or reasons not to take action, though there was a wide range (20 percent for breast cancer screening versus 80 percent for lower-back surgery) (Zikmund-Fisher et al., 2010b). These results largely have been replicated in surveys of Medicare patients who had surgery and in another survey of a cross-section of adults 40 or older (Fowler et al., 2012, 2013b). In addition, low-income Californians facing a major medical decision found that most health care practitioners offered no more than five of the nine fundamental support activities, such as discussing alternatives or providing the pros and cons (BSCF, 2014). The patterns vary some, depending on the decision, but patients judged that most decisions were clinician driven and that their own role was neither informed nor participatory. There is, then, little credible evidence that patients do not want to be informed and involved and a great deal of evidence that SDM is not the typical way in which clinicians make decisions with their patients today. Medicaid Services (CMS) administrator with data. During the Phase II period, providers would have been eligible to receive reimbursement for the use of certified patient decision aids, and in the final phase, the bill would have required providers to use patient decision aids for certain conditions as a standard of practice. Although the Empowering Patient Choices Act never became law, many of the proposed provisions found their way into the Patient Protection and Affordable Care Act (ACA), Public Law 111-148, 111th Cong. (March 23, 2010). Two provisions, Sections 3506 and 3021, are worthy of note. Section 3506 calls for the creation of a certification and quality process for patient decision aids; SDM resource centers; and provider development and use assessment, such that training and best practices are shared. There was also a provision that patient decision aids developed with federal money should be in the public domain. Although authorized, this provision was not granted appropriation. While it is law, it remains unfunded and is not being carried out. Recently, physician leadership and commentators have called for this part of the ACA to be funded on a bipartisan basis (Lee and Emanuel, 2013). Section 3021 created the innovation center within CMS. This section was not only authorized but also appropriated $10 billion in funding over the next decade. The administrator is given authority to test 18 models to reduce expenditures and enhance quality of care, and patient decision aids are among the models that may be tested. The language of this section includes the following wording: “Assisting applicable individuals in making informed health care choices by paying providers for using patient decision support tools that improve individual understanding of medical options.” The administrator has authority to accelerate funding for any provision that shows the promise of reducing expenditures. As a result, CMS is exploring new models of health care financing through the Medicare Shared Savings Accountable Care Organization (ACO). SDM is highlighted, implicitly or explicitly, in numerous sections of the ACO regulations. For instance, central to the ACO structure and governance is promoting patient engagement, which may include the use of decision support and “shared decision making methods with which the patient can assess the merits of various treatment options in the context of his or her values and convictions” (HHS, 2011). A set of initiatives promoting the patient-centered medical home (PCMH) is also noteworthy. The PCMH is fashioned in part on the Chronic Care Model, which includes, among other elements, redesigning ambulatory care to move away from a traditional chronic care approach to a “patient-centered, evidence based” model (Coleman et al., 2009). 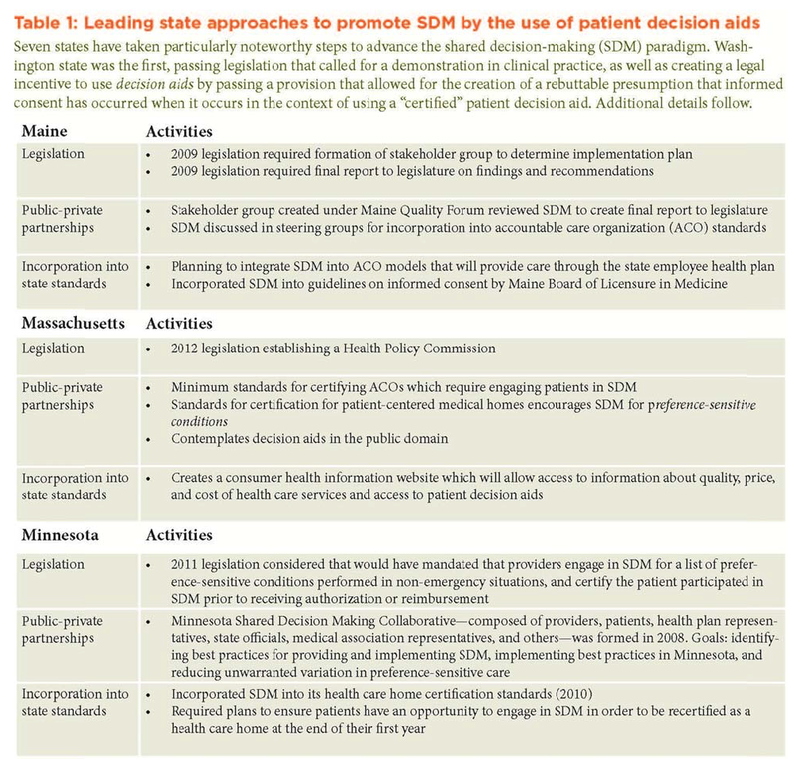 Patient-centered care is a core element of SDM, and, as reflected in recent state law, SDM is considered a qualifying criterion for certification as a PCMH as well as an ACO (Massachusetts Payment Reform Bill, 2012). In addition, CMS State Innovation Model grants have promoted SDM prominently. For example, Oregon has created a Coordinated Care Organization (CCO) network for eligible Medicaid and Medicare beneficiaries. Providers in a CCO should “emphasize prevention, healthy lifestyle choices, evidence-based practices, shared decision making and communication” (Coordinated Care Organization, 2012). Effective March 2014, elements of SDM are specifically measured in the PCMH Consumer Assessment of Healthcare Providers and Systems (CAHPS) survey, which is required to meet National Committee for Quality Assurance (NCQA) certification for primary care practices that seek to obtain the category of “Distinction in Patient Experience” (NCQA, 2014). In short, the federal system, and its interplay with states, uses a variety of levers to support the implementation of patient-centered care, and the use of patient decision aids and other ways of supporting SDM are seen as central to achieving that policy goal. Seven states (Maine, Massachusetts, Minnesota, Oregon, Vermont, Washington, and Wisconsin) have taken particularly noteworthy steps to promote SDM. Washington State was the first. It passed legislation that called for an SDM demonstration in clinical practice, as well as creating a legal incentive to use decision aids by passing a provision that allowed for the creation of a rebuttable presumption that informed consent has occurred when it takes place in the context of using a “certified” patient decision aid. The presumption can be overcome only by clear and convincing evidence. It is important to ensure that patients have an opportunity to make informed decisions that align with their values and preferences when they are faced with multiple treatment options (Moulton and King, 2010; Elwyn et al., 2013e). Literature on patient informed consent indicates that well-designed patient decision aids can lead patients to a better understanding of their treatment choices (King and Moulton, 2006; Pope and Hexum, 2013). Some studies suggest that disadvantaged populations could benefit directly from SDM (Brehaut et al., 2008, 2009; Galesic et al., 2009; Brehaut et al., 2010; Garcia-Retamero and Galesic, 2010; King et al., 2011; McRae et al., 2011; Taljaard et al., 2011; Weijer et al., 2011; Brehaut et al., 2012; Eckman et al., 2012; Gallo et al., 2012; McRae et al., 2013; Gillies, et al., 2014; Taljaard et al., 2014). Some evidence indicates that well-informed patients tend to select more conservative treatments when more conservative treatments are reasonable options and riskier ones offer no greater potential benefits (Stacey et al., 2014). Approaches to SDM vary, and states have taken steps to accelerate implementation through legislation, regulation, and private-public partnerships to promote the use of decision aids. 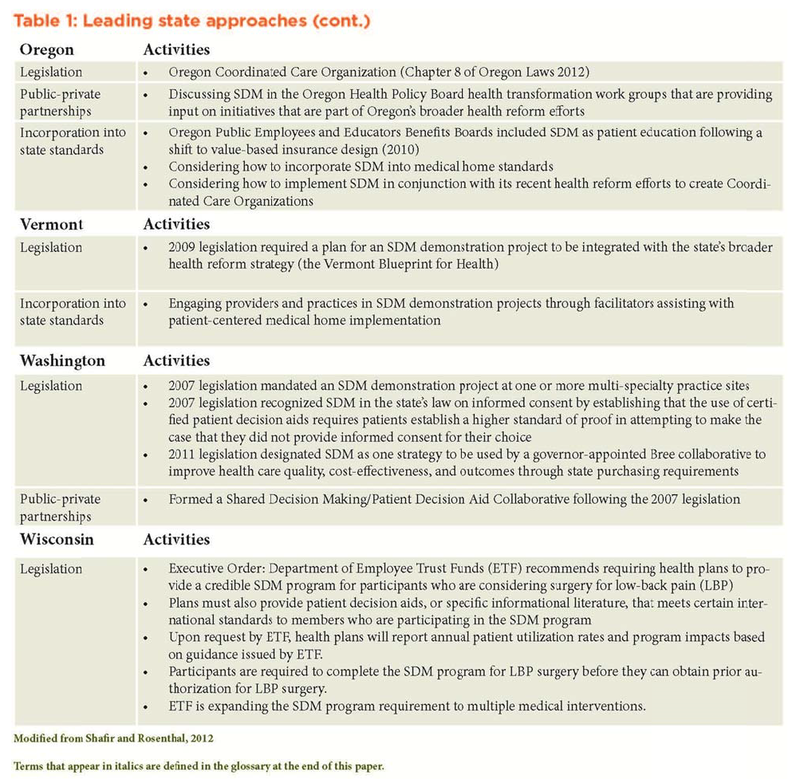 Table 1 provides an overview of leading state approaches. Table 1 notes that SDM requires that patients and clinicians achieve a meaningful, respectful dialogue as they arrive at decisions (Barry and Edgman-Levitan, 2012). Hence, the existence of legislation across a wide range of states to promote the use of decision aids should not be interpreted as evidence that no more needs to be done. As emphasized throughout this paper, patient decision aids are useful tools, but they do not in themselves constitute SDM. Bringing about SDM will require multiple policy approaches, new incentives, and a variety of changes in clinical practice processes. Equally important, it also will require a critical set of shifts in cultural norms and standards of professional accountability. In fact, studies show that merely providing decision aids to patients is not enough to change patient-clinician communication (Stacey et al., 2014). As a result, even as federal and state governments implement systems to encourage the use of decision aids, enlisting the medical community in the effort will be vital to achieving the actual practice of SDM; this effort is the subject of the next section of this report. 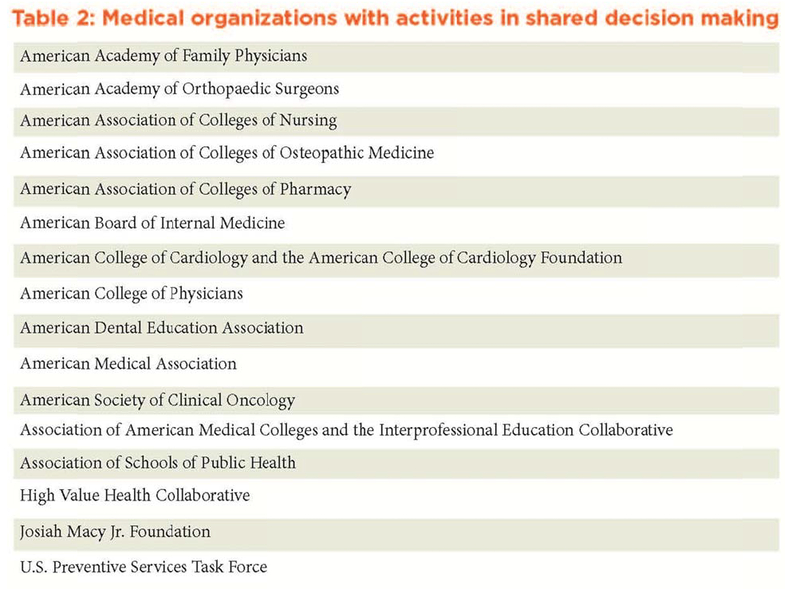 Over the past several years, a notable increase in interest in sharing decision making (SDM) has occurred in many medical professional organizations. As noted in Table 2 below, with expanded details in Appendix A, it is an encouraging sign that multiple professional organizations have embraced SDM at the leadership level. Position statements, practice guidelines, decision support tools, conference sessions, and continuing education are some of the methods used by these societies to raise the prominence of SDM and to encourage the adoption of tools and policies to support implementation. Despite these efforts, SDM has not become the norm in clinical practice. Why this is the case has been of interest to clinical and policy leaders throughout the medical community. 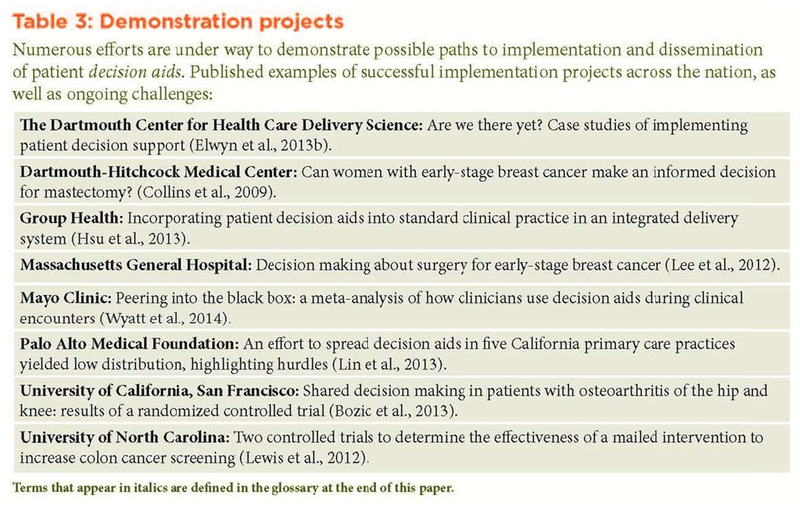 Demonstration projects (Table 3) indicate that the adoption of patient decision tools in practice depends on several factors and that many barriers to adoption remain (Elwyn et al., 2013b, 2013d; King and Moulton, 2013). Indeed, integrating SDM into clinical practice will require modifications across a wide range of activities and organizations, including educating patients about the value and availability of SDM and weaving the same messages into undergraduate and postgraduate health professional education, professional norms, patient expectations, compensation models, and standard setting for the development and use of decision aids and the process of SDM. One of the most important steps that could be taken to facilitate widespread adoption of decision aids, as one step toward achieving SDM, is setting standards for the development, testing, dissemination, and use of these tools. The next section of this paper explores issues in setting standards for decision aids. 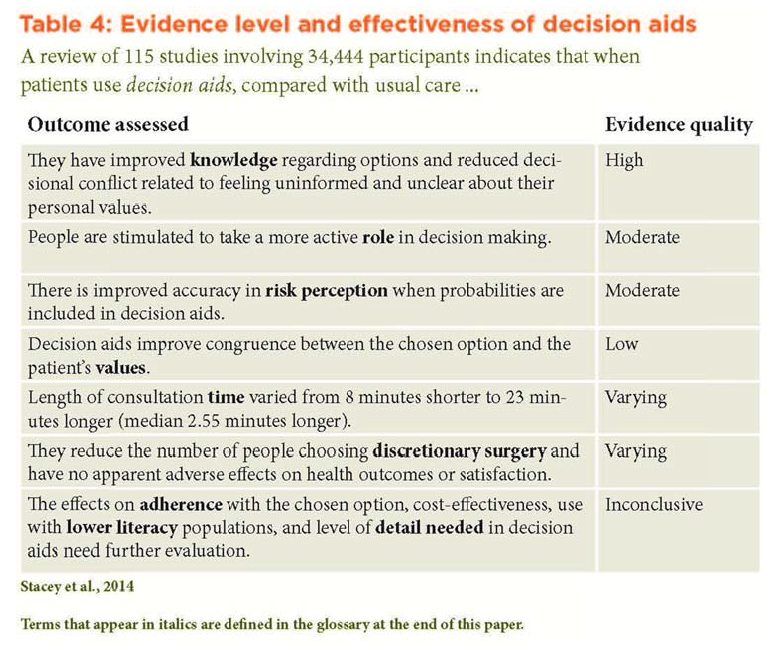 Decision aids are information delivery tools, such as leaflets, videos, DVDs, or websites that are intended to inform patients about the existence of medical options and the tradeoffs involved and to encourage them to consider their preferences and use these preferences to inform clinical decisions (see Table 4). We also have noted that the ACA was intended to support the development and use of high-quality patient decision aids, but that act’s requirement for a federal certification program for decision aids remains unfunded. Washington State has proposed moving ahead with a certification process at the state level (see Table 1). The key differences between other forms of informational materials and decision tools are that decision aids clearly indicate a decision point, explicitly acknowledge the existence of options, and describe those options, including the potential pros and cons associated with each, along with their likelihoods. Typically, decision aids are given to patients before or after their encounters with clinicians, or patients are instructed to access them online. Some offer explicit opportunities for individuals to explore and articulate their personal values and preferences that might affect decisions among available options, either on their own or in conversation with a clinician. A number of brief tools have been developed specifically for patients and clinicians to use together in clinical encounters, such as issues cards, option grids, and decision boxes (Breslin et al., 2008; Giguere et al., 2012; Elwyn et al., 2013c). Decision tools that are intended for joint use aim both to provide information about options and to support deliberation during the encounter in a manner that leads to the construction of informed patient preferences and a mutual decision about the care plan. Despite barriers to implemenation, there is clear interest in the use of decision aids. This interest is sparked, in part, by the provisions in the ACA and evidence on how decision aids can enhance patient knowledge and improve their decision making, as noted above. But interest is also driven b the potential for revenue for developers. This raises the possibility of the introduction of poor-quality tools that are not based on solid evidence or that selectively present or omit evidence and, thus, could impair rather than enhance patient decisions and lead to harm. To date, many decision tools have been introduced by myriad producers; their quality varies widely. Developing tools that are based on sound evidence, that are balanced and accessible, and that are as free of bias or conflicts of interest as possible demands significant expertise, commitment, and investment. And because the evidence base for the content of tools may change frequently, they need regular updating. This is particularly relevant in areas where rapid therapeutic changes occur, as in oncology, for instance, and it adds to the cost of producing and maintaining high-quality decision aids. One potential option to move this forward without duplicating efforts would be to attach the process of maintaining and evaluating the evidence base for developing decision aids into known independent and respected organizations already involved in assessing evidence, such as the Cochrane Collaboration. Of overriding concern is the potential for developers who could seek to enter the market as quickly as possible, with little concern for the accuracy, quality, or efficacy (i.e., the extent to which their tool actually promotes SDM) of the tools they market or with an agenda of creating a tool that will reduce or expand the use of a particular intervention. They may rely on “experts,” rather than conducting a careful appraisal and summary of the scientific literature. They may introduce tools that have only superficial levels of information or that are simply based on existing clinical practice guidelines, which can be outdated or otherwise of dubious quality (Lenzer et al., 2013; IOM, 2011). In sum, our suggestion is for a formal process to ensure the integrity of decision aids because patients, clinicians, and payers need to be assured that the patient decision aids they choose to use have been developed in a legitimate manner and carefully scrutinized for quality and transparency. This need arises from the recognition that decision aids are potentially powerful tools that can influence clinical care decisions. As a result, decision aids could cause harm and should not be used if they are developed to serve the interests of individuals, organizations, or companies that might profit from decisions made on the basis of their content. The International Patient Decision Aid Standards (IPDAS) Collaboration, a group of researchers and other stakeholders, has made significant progress toward assessing decision aids. Using a modified Delphi consensus process, the collaboration produced a checklist for developers to self-assess their products against a set of criteria for tool content, development process, and effectiveness (Elwyn et al., 2006). An International Patient Decision Aid Standards Instrument (IPDASi) was created for independent raters to grade tool quality using anchored scales, guided by an extensive manual (Elwyn et al., 2009). A consensus method also was used to establish a process for determining which parts of tools are considered “essential” and which parts are merely “desirable” (Joseph-Williams et al., 2013). The intervention should help patients to clarify values (Joseph-Williams et al., 2013). All six criteria must be met to qualify as a certifiable patient decision aid. These criteria represent the minimum definition of a patient decision aid. According to the IPDAS standards, a tool must first qualify as a decision aid before it can be certified. The quality score can be used to directly compare decision aids that address the same condition or set of treatment options, and it can be used as a benchmarking tool to guide developers to improve the quality of their patient decision aids over time. In addition, though many current decision aids are intended for patients to use on their own, some decision aids specifically seek to improve conversations between practitioners and patients to help them arrive at a shared decision. Examples include decision aids that encourage structured conversations about end-of-life care options. The ability of a decision aid to promote a productive conversation is another potential area for assessment, though efforts in this regard are much less well developed than the work of the IPDAS outlined above. There are a number of important issues and questions to address when considering opportunities for establishing a decision aid certification process in the United States; these issues and questions are summarized below. In considering these issues, some lessons might be learned from experiences outside the United States. The United Kingdom has taken preliminary steps to implement a national certification program for decision aids. The National Institute of Clinical Excellence (NICE) conducted a pilot in 2012 on the basis of IPDAS criteria. Certification of tools has not yet been initiated, but if it is, it is likely to be based on the Information Standard certification scheme (http://www.theinformationstandard.org/) and NICE’s accreditation of clinical guideline producers (http://www.nice.org.uk/accreditation). Setting criteria for certification – While the International Patient Decision Aid Standards (IPDAS) have laid the intellectual groundwork, there is an opportunity for a more appropriate organization to adopt and, undoubtedly, modify the IPDAS criteria and operationalize them (IPDAS, 2012). Assessing the content of tools, i.e., is the science accurately summarized? Although internationally recognized methods for assessing evidence syntheses exist, such as the Grading of Recommendations Assessment, Development and Evaluation (GRADE), none has been used consistently by patient decision support developers (Guyatt et al., 2008; Mustafa et al., 2013). This provides a real opportunity to set a standard for evaluating the quality of evidence that is provided to patients. The IPDAS Collaboration recently endorsed the GRADE approach to evidence appraisal of its trustworthiness and offered standards for methods for assessing the evidence review used to create a tool. the tools themselves might vary tremendously in quality, and their scientific validity would remain unexamined. On the other hand, certifying patient decision support tools individually would take considerable effort and expense, and stretches practicality. It would involve reading background material as well as assessing the tool itself. Current experience with the International Patient Decision Aid Standards Instrument indicates that this is at least one day’s work per assessor, per tool. Assessing the quality of the evidence synthesis would require additional time. The opportunity here is for an organization to pilot a method and test the market. Establishing a new entity or a new function for an existing entity? An organization capable of certifying patient decision support tools (or processes) would need to be independent of commercial interests, reputable, and have sufficient administrative, legal, and scientific expertise to undertake the work and earn the trust of patients, clinicians, and payers. In the ACA, the National Quality Forum was nominated as the entity to undertake certification in the United States, but has not done so. Other organizations have considered adopting this work, such as the National Committee for Quality Assurance, but, to date, no organization has taken this work forward. Assessing new methods for decision support – New methods of providing decision support to patients are now being used, such as telephone-based coaching, instant messaging, and interactive mobile applications. Ensuring that emerging tools and approaches meet reasonable standards for quality, balance, and safe use by patients will be a significant challenge. Section 3506 of the ACA clearly stated that a certification process for patient decision aids should be established in the United States, though, as noted earlier, this mandate remains unfunded. Despite subsequent discussion about national certification (as summarized in a report from the New America Foundation), and the request from commentators to fund Section 3506 of the ACA, no real progress has been made (Brownlee et al., 2013; Lee and Emanuel, 2013). In the meantime, Washington State has initiated its own preliminary processes (Shafir and Rosenthal, 2012). If other states follow, producers could face a regulatory patchwork. Rather than accepting a state-by-state approach, and without requiring funding under the ACA, we believe the outline of a realistic national certification framework is in view. It would have to fall under the auspices of an organization with a reputation for integrity and no direct relationship to those who create decision aids. Standards and protocols for the evaluation of decision aids would have to be widely accepted as being of high quality and developed by a process that includes all key stakeholders. Review standards should take into account that tools for use during clinical encounters require different considerations than those used by patients alone, because the dialogue between patient and clinician can provide context and added information. Public and private payers will have to agree to support the use of certified—and only certified—decision aids for use with appropriate patients. When providers are given incentives to seek out and use certified decision aids, there will be a strong incentive for developers to seek certification. Because of the large number of decision aids that are made, and will increasingly be made, to inform patients, and because of the ongoing need to ensure updates have been made, a regular source of funding will be required to support the evaluation process. In the absence of public sector funding, the most feasible mechanism is that the makers of decision aids that want their products certified will have to support the review process. Alternatives—such as incorporating the assessment process into existing review processes, like the peer review process of a medical journal or the assessment process of the Cochrane Collaborative, or adapting the Agency for Health Care Research and Quality evidence synthesis process to this purpose—appear both less likely to arise and less likely to be sustained over time. If shared decision making (SDM) is to become a standard of effective care, tied to incentives or simply as a quality standard for providers to achieve, it has to be measured. The prior section addressed challenges and opportunities for measuring the quality of decision aids, tools intended to facilitate SDM. This section addresses what we know about how to measure SDM itself, including the issues that need to be addressed to provide valid and reliable measurement of the quality of decision making in medical practices. related to those options. One way of measuring patient knowledge is by asking for answers to factual questions. Knowledge measures have been developed for discrete decisions, but this is a challenging task. Not only is consensus needed about the core facts, but there is also a requirement for constant updating as the science changes (Fagerlin et al., 2010; Sepucha et al., 2010). Although it is easier to ask patients to self-rate their level of knowledge, it has been shown that self-ratings of information are virtually unrelated to how much patients actually know (Sepucha et al., 2010). Other means of assessing knowledge, such as embedded interactive tests of understanding and comprehension of key issues, are only at the early stages of development. Measuring a patient’s involvement in the process of decision making is best achieved by asking patients to describe their interactions with providers when a decision was made. There is general agreement in the SDM literature about the elements of a good decision process (Charles et al., 1997; Davis et al., 2005; Patient-Centered Primary Care Collaboration, 2007; Elwyn and Miron-Shatz, 2009). These elements include the patient’s awareness of the choice and its related options, the opportunity to discuss the pros and cons of those options, and the opportunity to provide input into the decision (Zikmund-Fisher et al., 2010a, 2010b; Fowler et al., 2012; Elwyn et al., 2013a; Fowler et al., 2013a, 2013b). Several series of survey questions have been tested to measure the quality of the decisionmaking process (Zikmund-Fisher et al., 2010a, 2010b; Fowler et al., 2012, 2013b; Barr et al., 2014). A review found that few studies demonstrated the validity of these measures (Scholl et al., 2011). However, Barr et al. (2014) found that in a simulated study, assessments by recruited individuals accurately reflected differences in provider-patient interactions that they observed, and Pass et al. (2012) found good correspondence between patient reports of decision processes and coding of interactions that were tape recorded. Although there is no single set of questions that, as yet, has a strong body of evidence for its validity, these preliminary results suggest that valid and reliable measures can be constructed in the near future. This goal should be a priority. If good measures were obtained about patients’ level of knowledge related to decisions and their involvement in decision making, one could convincingly argue that the degree of SDM had been measured. Because of the measurement challenges in these domains, however, three other approaches to measuring SDM also deserve mention. An alternative to a “knowledge test” would be to assess whether patients were exposed to high-quality decision aids. There is bountiful experimental evidence that watching or reading good decision aids leads to improved knowledge (Stacey et al., 2014). The challenges are to agree on which decision aids are complete, accurate, and unbiased and to have assurance that patients completed the material and understood its content (Joseph-Williams et al., 2013). Another alternative measure, and perhaps the gold standard for assessing decision-making processes, is direct observation of clinician-patient interactions. Early studies of decision making in practice tape-recorded patient-physician interactions and coded them (Braddock et al., 1997, 1999). Although very useful in assessing the decision process, today this effort is very complex and expensive compared with patient surveys and hence would be very unlikely to be implemented on a large scale or on a routine basis. Ways to automate these analyses are being explored, however, which might radically alter the feasibility of routine recording and analysis of patient-clinician encounters. A third approach is to measure patient values to determine whether decisions made were matched to the individual’s goals, concerns, and preferences. This is a challenging approach, and researchers have struggled with how best to assess the decision made, in light of the individual patient’s values (Sepucha and Ozanne, 2010). Several approaches have been tried, each with strengths and weaknesses (Sepucha et al., 2011, 2012a, 2012b; Fowler et al., 2013a, 2013b). More work is needed before using this as a performance measure to assess the quality of decision making (Sepucha and Ozanne, 2010; Massachusetts General Hospital, 2014). One of the key practical problems to solve in measuring decision quality is identifying when, during the clinical visit, decisions are made. For a measurement protocol to be in place, it is essential that decision-making occasions that count can be reliably identified. The reason this is difficult is that decisions about specific interventions that are discussed, but not carried out, are unlikely to be consistently found in documentation. Patients can report them, but the reliability of patient reports is not well established. Meanwhile, decisions that result in interventions can be identified reliably in medical records and in claims data, but these constitute only a subset of all important decisions and decision makers (because those who chose not to undergo the intervention are not sampled). Still, they constitute the group of decisions that can be most reliably identified and, one could argue, a group of decisions that reliably have an impact on patients’ quality of life. On the other hand, it is possible that those individuals who chose to forgo specific interventions are systematically different from those who chose to pursue these interventions. More research is needed to understand the differences (with regard to demographics, values, the existence of comorbid conditions, and so forth) between people who do and do not have interventions that can be identified in medical records. In 1995, the Agency for Healthcare Research and Quality (AHRQ) launched a program to develop measures that would provide equivalent data to permit comparisons of patient health care experiences across providers and insurers (AHRQ, 2013). The three most extensive uses of these Consumer Assessment of Healthcare Providers and Systems (CAHPS) instruments to date have been to survey health plan members about their care experiences in the preceding year, ambulatory patients about outpatient office experience, and the Hospital CAHPS that is used to survey samples of Medicare patients who have been hospitalized. None of those instruments includes measures of how decisions are made, though they do explore patients’ experiences regarding information delivery in health care (Weidmer et al., 2012). The two national leadership organizations in health care quality measurement are the National Quality Forum and the National Committee for Quality Assurance (NCQA). The National Quality Forum has not had any measures of decision quality submitted for its review and endorsement. The NCQA has approved a CAHPS survey to be used to certify patient-centered medical homes (PCMH), which includes a module on SDM for patients who say they discussed starting or stopping a prescription medication with a provider. The most recent development on the measurement front is that CMS has approved a test version of clinical and group CAHPS for Accountable Care Organizations (ACOs) that was field tested by a number of ACOs in 2012 and 2013 (Berwick, 2011). The protocol for sampling is a cross-section of ambulatory patients. The survey instrument includes a specific three-question series (similar, but not identical, to the PCMH series) that asks about patients’ interactions with providers when patients report they made a decision to start or stop a prescription medication or a decision about whether to have surgery or some other procedure (CMS, 2013). The surveys rely on patients to identify when a decision was made. Samples are selected from all patients who had an ambulatory visit over a 6-month or 12-month period, which means, on average, there is a three- to six-month interval between the decision and the survey responses. The kinds of decisions included are necessarily heterogeneous; characteristics of decisions (what they are about, how acute, high or low stakes, and so forth) can affect how they are made. The rates at which decisions about major interventions, such as surgery, are the focus of the reporting is low, limiting the ability to describe decision making for what some might consider the most important decisions. There are no measures of how informed patients are. The surveys that are completed only cover patient reports of how they interacted with providers. To have meaningful measures of decision quality, in which both knowledge and decisionmaking processes are assessed, it is probably necessary to survey specifically targeted samples of individuals drawn from medical records who are known to have made a specific type of decision. Given the large number of types of decisions, the scope and costs of surveys to address many types of decisions in a single assessment likely would be prohibitive. It would be feasible, however, to target a rotating set of decisions (taking blood pressure medications, having a mammogram) for practices in a given year. With that approach, it is also feasible to include knowledge measures. Without this or a similar approach, it is difficult to envision how to measure directly how well informed the patients are who made a particular decision at a particular practice or hospital and how to have consistent and meaningful data across sites. They need to include measures of both how informed patients are about their options and the extent to which patients were involved in the decision-making process. The measures of knowledge have to be specific to the particular decision. Because of the wide variation in the types of and approaches to medical decisions, any measurement aimed at comparing provider quality ought to target similar clinical decisions in similar patient groups. As with any measurement, fair, consistent, and reliable protocols across practices, including adequate sample sizes and credible response rates, are essential. These challenges are not unique to decision quality, but work is needed to develop data collection protocols that ensure high-quality data. There has been considerable research in the past few years aimed at measuring knowledge and the decision-making process and how well decisions align with patient goals, concerns, and preferences. This work provides a solid foundation on which to build the needed measure. A high priority for those concerned with promoting SDM should be to push forward, in the reasonably near future, the methodological research needed to get a set of measures with proven reliability and validity that are widely accepted. Effective implementation and use of health information technology (health IT) has the potential to advance widespread adoption of shared decision making (SDM) in clinical practice. Technology tools, such as electronic health records (EHRs) and patient portals that enhance access to decision aids, and clinical workflows that encourage shared discussions between providers and patients are beginning to demonstrate valuable lessons in certain clinical settings. Setting standards to enable these system functions to take priority in the rapidly evolving health IT world are helping to establish an environment where technology expands the opportunity for patient engagement in care decisions (CMS, 2014). As described in Appendix B, the American Recovery and Reinvestment Act (ARRA) Public Law 111-5, 111th Cong. (February 17, 2009) has pushed the adoption of health IT to impressive rates. Despite this apparent progress, in much of current medical practice the information needs of both providers and patients frequently are not met because systems often have not been designed to make clinical information available in relevant and timely ways. Still, increasing capabilities to support online decision support tools, multimedia education tools, and mobile health applications are helping to overcome barriers that have previously hindered more effective use of these resources at the point of care. Health IT tools can be leveraged to facilitate information exchange and provide decision support in a timely manner, but products and services will need to be designed and implemented with patients and providers in mind. EHRs have the potential to enable the distribution of information to all care team members—including patients and families—and provide vastly improved communication between the system, the providers, and the patients. Existing and emerging national data standards can facilitate the retrieval and exchange of information within health IT and can provide opportunities for certain action steps to support SDM. Several important functions supported by health IT would be advanced by alignment with evolving standards. The following list highlights examples of where this alignment could be most beneficial. Providing relevant and appropriate information to support SDM between patients and providers. The question of how best to integrate support for the process of SDM into EHRs is a more challenging one (Friedberg et al., 2013). Clinicians might not recognize the clinical contexts for SDM, and they might have difficulty engaging in an ongoing dialogue to define patients’ preferences even when they recognize the appropriate contexts (Hsu et al., 2013). It will be important to recognize the opportunity for health IT not to focus simply on delivering information but also to serve as an efficient and effective way to elicit patient input on preferences and other relevant patient-generated data and to help create an environment that supports a genuine partnership between clinicians and patients. It is the view of the authors that the time has come to fully integrate the ideals of SDM into routine clinical practice, a task that will involve shifting expectations and behavior of both patients and clinicians. This should be our goal. We recognize that SDM will require cultural change, along with investments in time, training, and tools to succeed. Set out below are some of the concrete steps that should be taken to foster the widespread adoption of patient decision aids, tools that help inform patients of treatment options, and trigger the robust communication that is necessary for SDM to occur. Because of the wide variation in the types of and approaches to medical decisions, any measurement aimed at comparing provider quality ought to target similar clinical decisions among similar patient groups. Expand the role of employers/payers in promoting SDM. Public and private payers should agree to support the use of certified—and only certified—decision aids that are provided to appropriate patients. In addition, payers could announce a future goal of publicly reporting plans’ and providers’ use of SDM. As noted in Appendix C, employers can use a variety of means to get decision tools into the hands of employees, including making tools easily accessible; offering financial incentives for using tools; ensuring the quality of decision tools; and retooling health plans to ensure that tools are built into the benefits package. Similarly, employers can encourage the clinicians who see their employees to practice SDM. We suggest that employers partner with local health care provider organizations to ensure that their employees have an opportunity to be involved in SDM. There is a growing desire on the part of clinicians and patients to see SDM come about. But the road to fully integrating SDM into clinical practice likely will be long and winding. The steps suggested here represent only a portion of the work that will be needed to achieve that goal. SDM represents a potentially profound shift in medical culture and in the power dynamic between clinician and patient. Such cultural changes do not happen overnight. Still to come, for example, is a roadmap for training the next generation of clinicians so that they see eliciting patient preferences and values and sharing decisions with them as routine. Patients have waited 30 years for SDM to be fully and universally integrated into clinical practice. They should not have to wait another 30 years for this ideal to become a reality. Anchored scales – A method of eliciting a belief or preference. Anchored scales are any range of options, numbered or named, that have anchors (extremes, such as “best” and “worst,” and intermediate values). A validated scale is one in which researchers have shown that the different intermediate items are distinctions with a difference. In the case of the International Patient Decision Aid Standards Instrument, the anchored scale was devised to help independent raters measure the quality of decision aids across 10 dimensions. Barriers to adoption – Adoption refers to both the fact of using a new technology or intervention and the process that leads to it. A barrier is any factor that interferes with the process, whether within the adopter (e.g., lack of knowledge or mistrust) or within the system (e.g., lack of time or lack of reimbursement) or within the technology (e.g., complexity or lack of availability). Certification – The statement by a certifying body that a technology meets published standards. Certifying bodies get their authority either from regulation or by acclimation. Clinical practice guidelines – Systematic, evidence-based recommendations for optimal patient care based on assessments of the harms and benefits of alternative care options. Organizations that create guidelines may be physician professional organizations, government agencies, integrated health delivery networks, insurers, and others. Over the past several years, health care professionals have been promoting the use of clinical practice guidelines. They are intended to encourage the adoption and implementation of evidence-based recommendations that drive toward optimal patient care. Clinical practice processes – How clinical care is provided in any particular location. Cochrane Collaboration – http://www.cochrane.org/about-us – A global independent (i.e., non-government) network of health practitioners and researchers responding to the challenge of digesting vast amounts of evidence generated through research and making it useful for informing decisions about health. It is a not-for-profit organization with collaborators from more than 120 countries working together to produce credible, accessible health information that is free from commercial sponsorship and other conflicts of interest. Their published reviews must follow specific strict guidelines and formats. Consumer Assessment of Healthcare Providers and Systems (CAHPS) surveys – https://cahps.ahrq.gov/about-cahps/index.html – Consumer Assessment of Healthcare Providers and Systems (CAHPS) surveys ask consumers and patients to report on and evaluate their experiences with health care. These surveys cover topics that are important to consumers and focus on aspects of quality that consumers are best qualified to assess, such as clinicians’ communication skills and ease of access to health care services. Decision aids – Patient decision aids are tools to support patients’ decision making about complex medical choices. They aim to provide clear, balanced, and unbiased information about options and help patients identify and act upon their preferences and concerns regarding treatment options. Some are developed to support evidence-based conversations during the clinical encounter and help patients and clinicians deliberate together about those options. Others are developed to supplement conversations outside of the clinical encounter. Decision aids augment the shared decision-making process. Although they provide knowledge to patients, decision aids on their own do not rise to the level of shared decision making because they do not engage patients in open and transparent conversations about the best treatment options. Delphi consensus process – The Delphi consensus process, originally developed in the 1950s by the RAND Corporation, is a method that reduces the range of responses to arrive at something closer to expert consensus. A modified Delphi consensus process (that is, not following all the strict rules of the original RAND method) was used by the International Patient Decision Aid Standards (IPDAS) Collaboration http://ipdas.ohri.ca/ to create a checklist that would help developers enhance the quality of their patient decision support tools. It was used by the IPDAS Collaboration to select a final set of criteria for the checklist. Demonstration pilot – A project, generally funded by the government or private foundations, to demonstrate the possibility or feasibility of a new method. It does not establish the effect or impact of the technology. Eligible hospitals for the Medicare and Medicaid electronic health record (EHR) Incentive Programs – http://www.cms.gov/Regulations-andGuidance/Legislation/EHRIncentivePrograms/eligibility.html – Hospitals eligible for participating in the Medicare electronic health record (EHR) Incentive Program include critical access hospitals (CAHs), Medicare Advantage hospitals, and “subsection (d) hospitals” in the 50 states that are paid under the Inpatient Prospective Payment System as long as they demonstrate meaningful use of certified EHR technology. Meanwhile, acute care hospitals (including CAHs and cancer hospitals) with at least 10 percent Medicaid patient volume, and children’s hospitals qualify for the Medicaid EHR Incentive Program if they demonstrate “meaningful use” of EHR technology (which is further defined by government regulation). More than 5,000 eligible hospitals and CAHs have participated in the EHR incentive programs and have been reimbursed by Medicare and Medicaid. Eligible professionals for the Medicare and Medicaid EHR Incentive Programs – http://www.cms.gov/Regulations-andGuidance/Legislation/EHRIncentivePrograms/eligibility.html – Eligible professionals under the Medicare EHR Incentive Program include doctors of medicine or osteopathy, doctors of dental surgery or dental medicine, doctors of podiatry, doctors of optometry, and chiropractors. Meanwhile, eligible professionals under the Medicaid EHR Incentive Program include physicians, nurse practitioners, certified nurse-midwives, dentists, and physician assistants who work in a federally qualified health center or rural health clinic that is led by a physician assistant. For both programs, each eligible professional only qualifies for a payment (and only one payment regardless of how many locations they practice at) if they successfully demonstrate meaningful use of EHR technology and if they are an individual practitioner. Evidence – Data collected in a systematic way acknowledged by methodologists as being valid enough that the conclusions of the data (e.g., decision aid A is more effective than decision aid B) can be generalized beyond the patients in whom the data were collected. Evidence-based practice – Evidence-based practice is the explicit use of currently available research evidence to inform clinical decisions. Evidence-based practice also holds that evidence alone is insufficient to allow the clinician and patient to make good clinical decisions. Evidence alone does not take into account consideration of each individual’s values and preferences. Shared decision making requires access to the best available evidence to support more confident decision making as well as bringing to bear the patient context and informed values and preferences in the decisionmaking process. Evidence-based medicine is thus integral to shared decision making and vice versa. Evidence synthesis – Evidence synthesis involves the systematic collection, selection, and combination of multiple sources of data into a single measure. In the case of patient decision support tools, no procedure has been used consistently by developers to synthesize evidence. The International Patient Decision Aid Standards Instrument Collaboration http://www.ipdasi.org/ has endorsed the GRADE approach to evidence synthesis and has made a specific recommendation for using up-to-date and high-quality evidence summaries. Grading of Recommendations Assessment, Development and Evaluation (GRADE) – GRADE was developed by a widely representative group of international guideline developers and provides a system for rating quality of evidence. Its four categories—high, such as randomized clinical trials; moderate; low, such as observational studies; and very low—apply to the body of evidence and not to individual studies. In addition, GRADE assesses evidence quality separately from the process of making recommendations, which can factor in more than simply evidence quality (Balshem et al., 2011). Health Insurance Marketplaces (Marketplaces) – https://www.healthcare.gov/ – The Health Insurance Marketplaces (sometimes called “health insurance exchanges”) provide affordable privately managed health insurance to individuals who are currently uninsured and/or do not receive or cannot afford employer-based insurance. In these Marketplaces, no medical underwriting is allowed, and all 10 categories of Essential Health Benefits mandated by the Patient Protection and Affordable Care Act are covered. While state health insurance exchanges or marketplaces exist for the states that have opted to create their own exchange, residents of all other states must use the federal marketplace or exchange. The Health Insurance Marketplace is accessible online, by mail, by phone, or in person and provides individuals with plans and premium prices based on their household size, income, tobacco use, and geographic location. 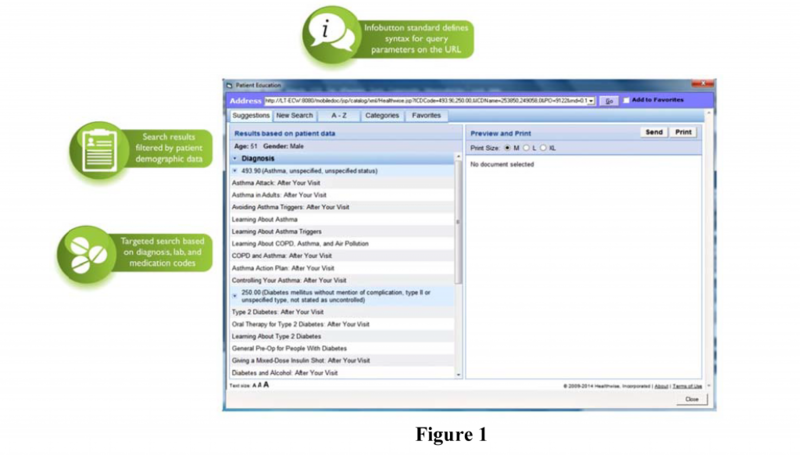 The Personalize Button Infobutton – http://www.openinfobutton.org/ – A method of linking a specific patient to outside data relevant to that patient. Infobuttons use an italic “I” icon to indicate a context within an electronic health record (EHR) where a provider can access additional information from a reference source. The Personalize Button would mark, in the EHR interface, a potential opportunity for shared decision-making. For example, next to the order for a prostate-specific antigen test, an icon of a person would appear. Clicking on this icon would open a window here the provider could access preference elicitation and value-clarification tools for patient use. Providers may then access the results of prior decision aids completed by the patient. Information Standard certification scheme – An independent certification program commissioned by the United Kingdom’s National Health Service for organizations that generate evidence-based health care information for the public. Organizations that have received certification have undergone stringent and thorough assessment to ensure that their information is clear, factual, balanced, evidence-based, and updated. The goal of the Information Standard is to help patients find accurate information among sources with varying quality and reliability. Informed consent – “The disclosure of appropriate information to a competent patient who is permitted to make a voluntary choice” (Appelbaum, 2007). Meaningful use of EHR – www.healthit.gov/policy-researchers-implementers/standards-and-certification-regulations – The Medicare and Medicaid Electronic Health Record (EHR) Incentive Programs give eligible professionals, hospitals, and critical access hospitals (CAHs) financial incentives for demonstrating “meaningful use” of certified EHR technology. interoperable electronic health records throughout the United States health care delivery system as a critical national goal. hospitals in 2016, under the revised timeline, and they require first successfully completing stage 1. Stage 2 focuses on improving care coordination, patient engagement, and clinical decision support, as well as decreasing health care costs overall. Eligible professionals must complete 20 core objectives, and eligible hospitals and critical access hospitals must complete 19 core objectives. Both need to demonstrate meaningful use for a full-year EHR reporting period. Meaningful use stage 3 – http://www.healthit.gov/providers-professionals/meaningful-use-definition-objectives – Scheduled to begin in 2017 under the revised timeline and will require first fulfilling stages 1 and 2. The focus in stage 3 is on improving outcomes, and its goals include increasing patients’ access to self-management tools; improving population health; providing decision support for national high-priority conditions; enhancing health quality, safety, and efficiency; and providing access to comprehensive patient data through patient-centered health information exchange. The notice of rule-making for this stage remains under development. Mobile health (mHealth) – The use of mobile and wireless devices, such as cellular phones, portable computers, or tablets, to improve health outcomes, services, and research. Uses for mobile health include collecting clinical and community health data; delivering health care information to providers, patients, and researchers; monitoring patients’ vital signs in real time; and providing care through mobile technologies. National Committee for Quality Assurance (NCQA) – A private, not-for-profit organization founded in 1990 to improve the health care system and quality of care for patients. Not only does the NCQA work with stakeholders such as employers, policy makers, clinicians, patients, and health plans to build momentum behind pressing health care quality problems, but it also serves as a reliable indicator for well-managed, high-quality care. Organizations incorporating the NCQA seal into their literature must first pass a rigorous, comprehensive review and provide annual performance reports to identify opportunities for improvement. National Committee for Quality Assurance (NCQA) patient-centered medical home recognition – http://www.ncqa.org/Programs/Recognition/Practices/PatientCenteredMedicalHomePCMH.aspx – A kind of certification of primary care practices that emphasizes care coordination and communication in their efforts to become medical homes. Not only can medical homes—a way of organizing primary care that emphasizes care coordination and communication—yield lower costs and higher care quality, but they also can lead to improved satisfaction and care experiences for both patients and providers. This recognition is the most frequently used pathway in transforming primary care practices to medical homes. Certification products represent a subset of the standards and guidelines for NCQA accreditation products and are appropriate for organizations that provide specific services but not comprehensive programs. Patient-centered medical home (PCMH) – The organization of a health care-providing entity to center care around the patient, including an ongoing, personal relationship with the patient, and emphasizing informing and engaging patients in decisions about their care. Shared decision making is an integral part of the PCMH concept. Preference-sensitive decisions – Preference-sensitive decisions are those for which the choices between medically reasonable options (or courses of action) are at least in part dependent on patients’ personal goals, concerns and preferences. For such decisions, it especially crucial that the selected treatment reflects the patient’s personal values and preferences and that patients have enough information about their options to make an informed choice with their clinician. Secure messaging – Allows patients and their caregivers to communicate electronically with their health care providers without compromising privacy. “Secure” here means that even if the message is intercepted, the contents cannot be unscrambled. These messages are sent by either the clinician or the patient and include structured, unstructured, or mixed-format content. Secure messaging is often offered as part of personal health records or other patient portals. The American Recovery and Reinvestment Act (ARRA) Public Law 111-5, 111th Cong. (February 17, 2009) has pushed the adoption of health information technology (health IT) to impressive rates. Adoption of electronic medical records (EMRs) by U.S. primary care physicians increased from 46 percent to 69 percent from 2009 to 2012 (Audet et al., 2014). Some 300,000 eligible professionals and more than 4,000 eligible hospitals have attested to meeting meaningful use stage 1. Some reports suggest that more than 90 percent of patients are currently supported by providers and hospitals with electronic health records (EHRs) (CMS, 2014). Standards associated with the ARRA are moving the nation to a more interoperable health care industry, allowing for sharing of EHRs among providers, payers, and patients. This comes against the backdrop of patients’ enhanced use of other digital technology to benefit their health (Frist, 2014). Use of technology—especially e-mail and text messages to and from providers—counts among factors that can reduce the discrepancy in care experiences between higher- and low-income Californians (BSCF, 2013). Although one-third of Americans have full access to their EMR, 57 percent are tracking their own health information, and 41 percent say they’ll switch providers to gain access to their health records (Accenture, 2013). Equally important, these meaningful use standards also may help facilitate shared decision making (SDM) in care processes and workflows, and online decision support tools can help clinicians and patients who face important decisions (Maviglia et al., 2006). Some of these tools may help providers to systematically provide information to patients or let them have access to high-quality information. These are meaningful steps forward in the potential efficient delivery of both long and short patient decision support materials in any format, given the digital nature of the platforms. There are many statements advocating that patient preferences and values, together with the medical evidence, should influence care and can improve the quality of a decision. In fact, as reflected recently in JAMA Internal Medicine, it may be considered a “medical error” to fail to elicit and account for patient preferences in important decisions, such as those at the end of life (Heyland et al., 2013). Whether health IT can solve this behavioral challenge remains to be seen. The information needs of both providers and patients are often not met because systems have not been able to make these tools available in meaningful and timely ways. This system failure has compromised the quality of care. But now, online decision support tools, multimedia education tools, and mobile applications that can meet many of these information needs may be capable of overcoming barriers that have previously hindered more effective use of these resources at the point of care. EHRs, now in wide use, have the potential to enable the distribution of decision support tools to care team members, including patients and their families. Existing and emerging national data standards can facilitate the retrieval and exchange of information within health IT and can provide opportunities for certain action steps to support SDM, such as eliciting or considering patient preferences and providing access to decision support tools in a timely manner. The question of how to integrate support for the process of SDM into EHRs is a more challenging one. Providers may not recognize the clinical contexts for SDM and may have difficulty engaging in an ongoing dialogue to define patients’ preferences, even when they recognize the contexts (Hsu et al., 2013). One illustration of the potential for health IT to be leveraged to advance SDM is the Infobutton. Infobuttons are decision support retrieval tools that make it easier to access online decision aids and knowledge resources. Infobuttons integrate these resources – for both the provider and the patient – within the EHR, personal health record (PHR), and mobile health (MH) systems. The Infobutton can retrieve information based on the clinical context, such as EHR/PHR workflow tasks, user role, care setting, patient demographics (for example, age or gender), language, allergies, medication, test results, vital signs, and problems (Del Fiol et al., 2008). The use of Infobuttons is one potential option to integrate reminders to clinicians without interrupting clinical activities (Del Fiol et al., 2013). Infobuttons are in wide use today by most EHRs, content vendors, and public health information sources. Capitalizing on the opportunity for the Infobutton to support SDM will require that its functions are leveraged in a manner that not only reminds the provider, but also builds in high-quality, certified patient decision support tools. As depicted in Figure 1, the first job of the Infobutton is retrieval of an intervention. It uses the context of the patient, the provider, and the task within the EHR to retrieve the best available interventions. These interventions could be a tool, a consultation online, a video, a document, a game, or a mobile app. The second job of the Infobutton is to document which tools were selected and delivered. Consequently, when a patient responds to a decision aid, the results contained in the response are captured in the EHR. In addition, EHRs could flag conditions for which patient decision support tools are available. Provider and task contexts further help to identify places within the workflow where the use of patient decision aids could be promoted. These tasks might include referral, appointment scheduling, pre-admission, tests and results, and discharge. Preference assessments could be recorded in decision aids and transmitted to the EHR/PHR/MH to be incorporated into the patient record and used in consultations and discussions. Since the use of the Infobutton standard in meaningful use for patient-specific education materials, estimates presented during the American Medical Informatics Association annual meeting reported usage in the millions. The tool was in early adopting EHRs as early as January 2014 for use in selecting provider reference materials and patient-specific education materials. The use of Infobuttons is a requirement for meaningful use stage 2 (HHS, 2013). This requirement creates a strong foundation for the delivery of clinical decision support into the workflow. Thus, the evolving Infobutton standard, patient-specific context, and integration of external expert systems all will be important considerations in future meaningful use phases for clinical decision support research. Employers and other payers can play an influential role in promoting shared decision making (SDM). Employers collectively provide insurance to 59 percent of Americans, making them key messengers to reach this audience of 160 million workers (BLS, 2012). Employees look to their employer as a source of health information: In 2010, 75 percent of surveyed employees indicated that they used health or medical information from their employer, a 21 percent jump from 2007 (National Business Group on Health, 2011). ensuring the decision aids meet quality standards on an ongoing basis. Below we offer a checklist of ideas for employers and payers to consider in promoting SDM. Educating employees on ways to be an active health care consumer and a member of the health care team is the foundation of SDM. Employers can distribute information about the importance of being an active health care participant to employees and their dependents through mail, Web portals, wellness websites, secure messaging, Facebook, and blog posts. The goal is to educate employees about SDM, since the concept is still foreign to many who believe it is inappropriate to question a health care provider. To take the promotion approach one step further, employers also can explicitly offer high-quality DAs to employees. These tools provide specific information about medical options, presented in an unbiased manner, with evidence as the key basis for explaining benefits and harms. DAs can be in the form of printed booklets, DVDs, videos, and interactive Web modules. Some DAs are available in the public domain. Others may be produced by a care management company for the employer to purchase for use by its workforce. Employers and payers can work directly with their health plans through the contracting process so that DAs are included in the services offered to an employee. Health plans can offer these tools through the member website, as part of a 24-hour nurse line, through case management programs, or during the pre-authorization process. Employers can integrate DAs into places where employees seek health information, such as health plan portals, transparency platforms, health assessment, and biometric screening results. Employees who access these sources already are seeking health information; placing aids in front of these activated consumers may lead to increased use. Employers also may improve DA use by easing access to them at a teachable moment when employees need these tools the most: often after a diagnosis, when selecting a new treatment plan, or when facing preference-sensitive treatment options. An employer’s partner, either a health plan or health management company, can work on their behalf to identify members who would benefit from DAs and create prompts to encourage their use. Vendor partners can do this through the use of health assessment results, claims data, and demographic information, and employers can construct this expectation as part of the contract. Once employees have full access to DAs, employers can encourage the use of these tools through plan design. This strategy would involve promoting, or perhaps requiring, the use of DAs prior to receiving a financial incentive, reaching better coverage levels for medical services, or having the operation or treatment. Employers may offer incentives (directly in paychecks or as a deposit into a health savings account or health reimbursement arrangements) that are delivered after completion of a DA, or requirements, such as a penalty imposed when an individual foregoes a DA prior to surgery. One way employers can do this is by instituting a precertification process in which employees must access a DA when facing specific procedures that are preference-sensitive and are commonly overused (hysterectomy, hip and knee replacement, lower-back surgery). To provide employees with their best chance at obtaining good quality care, employers also should regularly check that the DAs meet quality standards on an ongoing basis. Employers should not offer decision aids without due diligence; the quality varies among the approximately 500 types of DAs (Ottawa Hospital Research Institute) that are available. For example, some tools are created by companies that have a financial stake in a medical procedure or prescription drug; others lack sufficient evidence, which leads to inaccurate estimates of benefits and harms. In the absence of a well-accepted national or international program for certification of SDM tools, employers should use a checklist, such as the International Patient Decision Aid Standards Collaboration’s checklist to determine if DAs meet established quality criteria (International Patient Decision Aid Standards Collaboration, 2012; Rich, 2013). Employers, clinicians, and patients alike can use this checklist. Employers and other payers that would like to instill SDM into their overall health care strategy have numerous opportunities through promotional campaigns, integration with current tools and resources, and incentives/requirements. The approach adopted should align with the company’s or payer’s culture and philosophy toward its role in employees’ health care. As the state-run Health Insurance Marketplaces begin to take shape, this set of tactics can be translated to encourage enrollees to practice SDM. Various aspects of the Patient Protection and Affordable Care Act (ACA) support SDM concepts. Integrating these recommendations within health plans offered as part of the Marketplaces will further reinforce the ACA’s overall mission to improve the quality and value of health care in the United States. Accenture. 2013. More than 40% of U.S. consumers willing to switch physicians to gain online access to electronic medical records. http://newsroom.accenture.com/news/more-than-40-percent-of-us-consumers-willing-to-switchphysicians-to-gain-online-access-to-electronic-medical-records-according-to-accenturesurvey.htm (accessed February 4, 2014). AHRQ (Agency for Healthcare Research and Quality). 2013. Consumer assessments of health plans and systems surveys and tools to advance patient-centered care. https://cahps.ahrq.gov (accessed December 2, 2013). Appelbaum, P. 2007. Clinical practice. Assessment of patients’ competence to consent to treatment. New England Journal of Medicine 357(18):1834-1840. Audet, A., D. Squires, and M. Doty. 2014. Where are we on the diffusion curve? Trends and drivers of primary care physicians’ use of health information technology. Health Services Research (1 Pt. 2):347–360. Balshem, H., M. Helfand, H. Schünemann, A. Oxman, R. Kunz, J. Brozek, G. Vist, Y. Falck-Ytter, J. Meerpohl, S. Norris, and G. Guyatt. 2011. GRADE guidelines: 3. Rating the quality of evidence. Journal of Clinical Epidemiology 64(4):401-406. Barr P., R. Thompson, T. Walsh, S. Grande, E. Ozanne, and G. Elwyn. 2014. The psychometric properties of CollaboRATE: A fast and frugal patient-reported measure of the shared decisionmaking process. Journal of Medical Internet Research 16(1):e2. Barry, M., and S. Edgman-Levitan. 2012. Shared decision making: Pinnacle of patient-centered care. New England Journal of Medicine 366:780–781. Berwick, D. 2011. Launching accountable organizations: The proposed rule for the Medicare Shared Savings Program. New England Journal of Medicine 364:e32. Bozic, K., J. Belkora, V. Chan, J. Youm, T. Zhou, J. Dupaix, A. Bye, C. Braddock 3rd, K. Chenok, and J. Huddleston 3rd. 2013. Shared decision making in patients with osteoarthritis of the hip and knee: Results of a randomized controlled trial. Journal of Bone and Joint Surgery 95(18):1633–1639. (BLS) Bureau of Labor Statistics. 2012. Healthcare benefits: Access, participation, and take-up rates, civilian workers. National Compensation Survey. http://www.bls.gov/ncs/ebs/benefits/2012/ebbl0050.pdf (accessed August 8, 2013). Braddock, C., S. Fihn, W. Levinson, A. Jonsen, and R. Pearlman. 1997. How doctors and patients discuss routine clinical decisions: Informed decision making in the outpatient setting. Journal of General Internal Medicine 12:339–345. Braddock, C., K. Edwards, N. Hasenberg, T. Laidley, and W. Levinson. 1999. Informed decision making in outpatient practice: Time to get back to basics. Journal of the American Medical Association 282: 2313–2320. Brehaut, J., A. Lott, D. Fergusson, K. Shojania, J. Kimmelman, and R. Saginur. 2008. Can patient decision aids help people make good decisions about participating in clinical trials? A study protocol. Implementation Science 3:38. Brehaut, J., R. Saginur, and G. Elwyn. 2009. Informed consent documentation necessary but not sufficient. Contemporary Clinical Trials 30(5):388–389. Brehaut, J., D. Fergusson, J. Kimmelman, K. Shojania, R. Saginur, and G. Elwyn. 2010. Using decision aids may improve informed consent for research. Contemporary Clinical Trials 31(3):218–220. Brehaut, J., K. Carroll, G. Elwyn, R. Saginur, J. Kimmelman, and K. Shojania. 2012. Informed consent documents do not encourage good-quality decision making. Journal of Clinical Epidemiology 65(7):708–724. Breslin, M., R. Mullan, and V. Montori. 2008. The design of a decision aid about diabetes medications for use during the consultation with patients with type 2 diabetes. Patient Education and Counseling 73:465–472. ing_the_playing_field.pdf (accessed February 4, 2014). BSCF. 2014. Improving the safety-net patient experience: 10 things health centers can do. http://blueshieldcafoundation.org/sites/default/files/BSCF_10_Things_IssueBrief_Final.pdf (assessed March 13, 2014). Charles, C., A. Gafni, and T. Whelan. 1997. Shared decision-making in the medical encounter: What does it mean? (or it takes at least two to tango). Social Science and Medicine 44 (5): 681–692. Chewning B., C. Bylund, B. Shah, N. Arora, J. Gueguen, and G. Makoul. 2012. Patient preferences for shared decisions: A systematic review. Patient Education and Counseling 86(1):9–18. CMS (Centers for Medicare & Medicaid Services). 2013. Medicare Shared Savings Program. http://www.cms.gov/Medicare/Medicare-Fee-for-Service-Payment/sharedsavingsprogram/ (accessed April 25, 2014). CMS. 2014. EHR incentive programs. http://www.cms.gov/Regulations-andGuidance/Legislation/EHRIncentivePrograms/index.html?redirect=/EHRIncentivePrograms/ (accessed May 12, 2014). Coleman, K., B. Austin, C. Brach, and E. Wagner. 2009. Evidence on the chronic care model in the new millennium. Health Affairs 28(1):75–85. Collins, E., C. Moore, K. Clay, S. Kearing, A. O’Connor, H. Llewellyn-Thomas, R. Barth, and K. Sepucha. 2009. Can women with early-stage breast cancer make an informed decision for mastectomy? Journal of Clinical Oncology 27:519–525. Coordinated Care Organization. February 23, 2012. Proposal, SB 1580, 76th Oregon Legislative Assembly. Chapter 8, Laws of 2012, Section 20, Part 2(k)(C). Couët, N., S. Desroches, H. Robitaille, H. Vaillancourt, A. Leblanc, S. Turcotte, G. Elwyn, and F. Légaré. 2013. Assessments of the extent to which health care providers involve patients in decision making: A systematic review of studies using the OPTION instrument. Health Expectations (epub ahead of print). http://onlinelibrary.wiley.com/doi/10.1111/hex.12054/pdf (accessed May 28, 2014). Davis, K., S. Schoenbaum, and A. Audet. 2005. A 2020 vision of patient-centered primary care. Journal of General Internal Medicine 20(10):953–957. Del Fiol, G., P. Haug, J. Cimino, S. Narus, C. Norlin, and J. Mitchell. 2008. Effectiveness of topic-specific Infobuttons: A randomized controlled trial. Journal of the American Medical Informatics Association 15(6):752-759. Del Fiol, G., C. Curtis, and J. Cimino. 2013. Disseminating context-specific access to online knowledge resources within electronic health record systems. Studies in Health Technology and Informatics 192:672-676. Dillard, A., M. Couper, and B. Zikmund-Fisher. 2010. Perceived risk of cancer and patient reports of participation in decisions about screening: The DECISIONS study. Medical Decision Making 30(5 Supp):96S–105S. Eckman, M., R. Wise, A. Leonard, E. Dixon, C. Burrows, F. Khan, and E. Warm. 2012. Impact of health literacy on outcomes and effectiveness of an educational intervention in patients with chronic diseases. Patient Education and Counseling 87(2):143–151. Elwyn, G., and T. Miron-Shatz. 2009. Deliberation before determination: The definition and evaluation of good decision making. Health Expectations 13:139–147. Elwyn, G., A. O’Connor, D. Stacey, R. Volk, A. Edwards, A. Coulter, R. Thomson, A. Barratt, M. Barry, S. Bernstein, P. Butow, A. Clarke, V. Entwistle, D. Feldman-Stewart, M. Holmes-Rovner, H. Llewellyn-Thomas, N. Moumjid, A. Mulley, C. Ruland, K. Sepucha, A. Sykes, and T. Whelan. 2006. Developing a quality criteria framework for patient decision aids: Online international Delphi consensus process. British Medical Journal 333(7565):417–423. Elwyn, G., A. O’Connor, C. Bennett, R. Newcombe, M. Politi, M. Durand, E. Drake, N. JosephWilliams, S. Khangura, A. Saarimaki, S. Sivell, M. Stiel, S. Bernstein, N. Col, A. Coulter, K. Eden, M. Härter, M. Holmes Rovner, N. Moumjid, D. Stacey, R. Thomson, T. Whelan, T. van der Weijden, and A. Edwards. 2009. Assessing the quality of decision support technologies using the International Patient Decision Aid Standards instrument (IPDASi). PLoS One 4(3):e4705. Elwyn, G., P. Barr, S. Grande, R. Thompson, T. Walsh, and E. Ozanne. 2013a. Developing CollaboRATE: A fast and frugal patient-reported measure of shared decision making in clinical encounters. Patient Education and Counseling 93(1):102-7. Elwyn, G., S. Grande, M. Godfrey, J. Hoffer Gittell, and D. Collins Vidal, eds. 2013b. Are we there yet? Case studies of implementing patient decision support. Hanover, NH: Dartmouth Center for Health Care Delivery Science and Dartmouth Institute for Healthcare Policy and Clinical Practice. Elwyn, G., A. Lloyd, N. Joseph-Williams, E. Cording, R. Thomson, M. A. Durand, and A. Edwards. 2013c. Option grids: Shared decision making made easier. Patient Education and Counseling 90(2):207–212. Elwyn, G., I. Scholl, C. Tietbohl, M. Mann, A. Edwards, C. Clay, F. Légaré, T. van der Weijden, C. Lewis, R. Wexler, and D. Frosch. 2013d. Many miles to go: A systematic review of the implementation of patient decision support interventions into routine clinical practice. BMC Medical Informatics and Decision Making 13(suppl. 2):S14. Elwyn, G., J. Tilbert, and V. Montori. 2013e. The ethical imperative for shared decision making. European Journal for Person Centered Healthcare 1:129–131. Fagerlin, A., K. Sepucha, M. Couper, C. Levin, E. Singer, and B. Zikmund-Fisher. 2010. Patients’ knowledge about 9 common health conditions: The DECISIONS survey. Medical Decision Making 30:35S–52S. Fowler, F. 2011. Patients want to be involved. Informed Medical Decisions Foundation. http://informedmedicaldecisions.org/imdf_perspectives/foundation-perspectives-patients-want-tobe-involved/ (accessed June 3, 2013). Fowler, F., P. Gallagher, J. Bynum, M. Barry, F. Lucas, and J. Skinner. 2012. Decision-making process reported by Medicare patients who had coronary artery stenting or surgery for prostate cancer. Journal of General Internal Medicine 27(8): 911–916. Fowler, F., P. Gallagher, K. Drake, and K. Sepucha. 2013a. Decision dissonance: Evaluation of an approach to measuring the quality of surgical decision making. Joint Commission Journal on Quality and Patient Safety 39(3):136–144. Fowler, F., B. Gerstein, and M. Barry. 2013b. How patient-centered are medical decisions? JAMA Internal Medicine 173(13):1215–1221. Friedberg, M., K. Van Busum, R. Wexler, M. Bowen, and E. Schneider. 2013. A demonstration of shared decision making in primary care highlights barriers to adoption and potential remedies. Health Affairs 32(2): 268–275. Frist, W. 2014. Connected health and the rise of the patient-consumer. Health Affairs 33(2):191-193. Frosch, D., S. May, K. Rendle, C. Tietbohl, and G. Elwyn. 2012. Authoritarian physicians and patients fear of being labeled “difficult” are key obstacles to shared decision making. Health Affairs 31(5): 1030–1038. Galesic, M., R. Garcia-Retamero, and G. Gigerenzer. 2009. Using icon arrays to communicate medical risks: Overcoming low numeracy. Health Psychology (2):210–216. Gallo, A., C. Weijer, A. White, J. Grimshaw, R. Boruch, and J. Brehaut. 2012. What is the role and authority of gatekeepers in cluster randomized trials in health research? Trials 13:116. Garcia-Retamero, R., and M. Galesic. 2010. Who profits from visual aids: Overcoming challenges in people’s understanding of risks [corrected]. Social Science and Medicine 70(7):1019–1025. Giguere, A., M. Labrecque, R. Grad, M. Cauchon, M. Greenway, F. Légaré, P. Pluye, S. Turcotte, L. Dolovich, and R. Haynes. 2012. Barriers and facilitators to implementing decision boxes in primary healthcare teams to facilitate shared decision making: A study protocol. BMC Medical Informatics and Decision Making 12:85. Gillies, K., W. Huang, Z. Skea, J. Brehaut, and S. Cotton. 2014. Patient information leaflets (PILs) for UK randomised controlled trials: A feasibility study exploring whether they contain information to support decision making about trial participation. Trials 15:62. PubMed PMID: 24548781. Guyatt, G., A. Oxman, G. Vist, R. Kunz, Y. Falck-Ytter, P. Alonso-Coello, H. Schünemann, and GRADE Working Group. 2008. Rating quality of evidence and strength of recommendations GRADE: an emerging consensus on rating quality of evidence and strength of recommendations. British Medical Journal 336:924–926. Heyland, D., D. Barwich, D. Pichora, P. Dodek, F. Lamontagne, J. You, C. Tayler, P. Porterfield, T. Sinuff, J. Simon, ACCEPT (Advance Care Planning Evaluation in Elderly Patients) Study Team, and Canadian Researchers at the End of Life Network (CARENET). 2013. Failure to engage hospitalized elderly patients and their families in advance care planning. JAMA Internal Medicine 173(9):778-787. HHS (Department of Health and Human Services). 2011. Medicare Program; Medicare Shared Savings Program: Accountable Care Organizations; Final Rule. Federal Register 76 (212) 67828. HHS. 2013. Stage 2 meaningful use hospital menu. http://www.cms.gov/Regulations-and- Guidance/Legislation/EHRIncentivePrograms/downloads/Stage2_HospitalMenu_1_AdvanceDirective.pdf (accessed October 22, 2013). Hsu, C., D. Liss, E. Westbrook, and D. Arterburn. 2013. Incorporating patient decision aids into standard clinical practice in an integrated delivery system. Medical Decision Making 33(1):85–97. IPDAS (International Patient Decision Aid Standards) Collaboration. 2012. The 2012 IPDAS background document: An introduction. http://ipdas.ohri.ca/IPDAS-Introduction.pdf (accessed April 24, 2013). Joseph-Williams, N., R. Newcombe, M. Politi, M. A. Durand, S. Sivell, D. Stacey, A. O’Connor, R. Volk, A. Edwards, C. Bennett, M. Pignone, R. Thomson, and G. Elwyn. 2013. Toward minimum standards for certifying patient decision aids: A modified Delphi consensus process. Medical Decision Making, http://mdm.sagepub.com/content/early/2013/08/20/0272989X13501721 (accessed December 1, 2013). Katz, J. 1984. The silent world of doctor and patient. New York: Free Press. Kiesler, D., and S. Auerbach. 2006. Optimal matches of patient preferences for information, decisionmaking and interpersonal behavior: Evidence, models and interventions. Patient Education and Counseling 61(3):319–341. King, J., and B. Moulton. 2006. Rethinking informed consent: The case for shared medical decision making. American Journal of Law and Medicine 32(4) 429–501. King, J., and B. Moulton. 2013. Group Health’s participation in a shared decision-making demonstration yielded lessons, such as role of culture change. Health Affairs 32(2):294–302. King, J., M. Eckman, and B. Moulton. 2011. The potential of shared decision making to reduce health disparities. Journal of Law, Medicine and Ethics 39:30–33. Krumholz, H. 2010. Informed consent to promote patient-centered care. Journal of the American Medical Association 303(12):1190–1191. Lee, C., C. Hultman, and K. Sepucha. 2010a. Do patients and providers agree about the most important facts and goals for breast reconstruction decisions? Annals of Plastic Surgery 64(5):563–566. Lee, C., M. Barry, C. Cosenza, R. Dominik, A. Mulley, A. O’Connor, and K. Sepucha. 2010b. Development of instruments to measure the quality of breast cancer treatment decisions. Health Expectations 13(3):258–272. Lee, C., Y. Chang, N. Adimorah, J. Belkora, B. Moy, A. Partridge, D. Ollila, and K. Sepucha. 2012. Decision making about surgery for early-stage breast cancer. Journal of the American College of Surgeons 214(1):1–10. Lee, E. and E. Emanuel. 2013. Shared decision making to improve care and reduce costs. New England Journal of Medicine 368:6–8. Légaré, F., M. Politi, R. Drolet, S. Desroches, D. Stacey, and H. Bekker. 2012. Training health professionals in shared decision-making: An international environmental scan. Patient Education and Counseling 88(2):159-69 PMID: 22305195. Lenzer, J., J. Hoffman, C. Furberg, and J. Ioannidis. 2013. 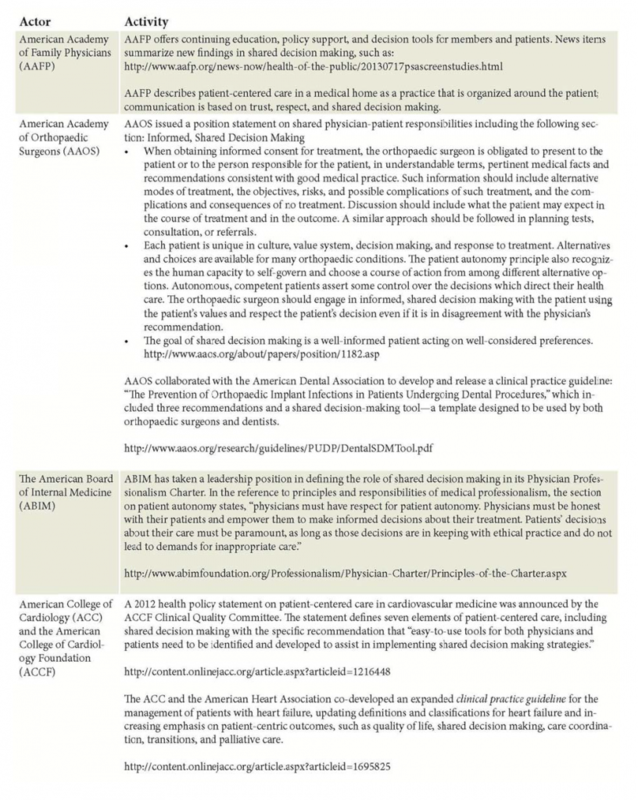 Ensuring the integrity of clinical practice guidelines: A tool for protecting patients. British Medical Journal 347:f5535. Lewis, C., A. Brenner, J. Griffith, C. Moore, and M. Pignone. 2012. Two controlled trials to determine the effectiveness of a mailed intervention to increase colon cancer screening. North Carolina Medical Journal 73(2):93–98. Lin, G., M. Halley, K. Rendle, C. Tietbohl, S. May, L. Trujillo, and D. Frosch. 2013. An effort to spread decision aids in five California primary care practices yielded low distribution, highlighting hurdles. Health Affairs 32(2):311–320. Makoul, G., and M. Clayman. 2006. An integrative model of shared decision making in medical encounters. Patient Education and Counseling 60(3):301–312. Massachusetts General Hospital. 2014. Health Decision Sciences Center. http://www.massgeneral.org/decisionsciences/research/DQ_Instrument_List.aspx (accessed April 28, 2014). Massachusetts Payment Reform Bill. 2012. Massachusetts General Laws, Chapter 6D, Title II, Sections 14 and 15. Maviglia, S., C. Yoon, D. Bates, and G. Kuperman. 2006. KnowledgeLink: Impact of context-sensitive information retrieval on clinicians’ information needs. Journal of the American Medical Informatics Association 13(1):67-73. McRae, A., C. Weijer, A. Binik, J. Grimshaw, R. Boruch, and Brehaut. 2011. When is informed consent required in cluster randomized trials in health research? Trials 12:202. McRae, A., C. Bennett, J. Brown, C. Weijer, R. Boruch, and J. Brehaut. 2013. Researchers’ perceptions of ethical challenges in cluster randomized trials: A qualitative analysis. Trials 14:1. Moulton, B., and J. King. 2010. Aligning ethics with medical decision making: The quest for informed patient choice. Journal of Law, Medicine and Ethics 38:85–97. Mustafa, R., N. Santesso, J. Brozek, A. Akl, S. Walter, G. Norman, M. Kulasegaram, R. Christensen, G. Guyatt, Y. Falck-Ytter, S. Chang, M. Murad, G. Vist, T. Lasserson, G. Gartlehner, V. Shukla, X. Sun, C. Whittington, P. Post, E. Lang, K. Thaler, I. Kunnamo, H. Alenius, J. Meerpohl, A. Alba, I. Nevis, S. Gentles, M. Ethier, A. Carrasco-Labra, R. Khatib, G. Nesrallah, J. Kroft, A. Selk, R. Brignardello-Petersen, and H. Schünemann. 2013. The GRADE approach is reproducible in assessing the quality of evidence of quantitative evidence syntheses. Journal of Clinical Epidemiology 66(7):736–42; quiz 742.e1–5. National Business Group on Health. 2011. Employee attitudes toward health information and comparative effectiveness research. https://www.businessgrouphealth.org/login/index.cfm?rd=%2Fpub%2Ff305077e%2D2354%2Dd714%2D5174%2D598e62c40eed (accessed October 25, 2013). http://www.ncqa.org/tabid/1429/Default.aspx (accessed April 25, 2014). O’Connor, A., H. Llewellyn-Thomas, and A. Flood. 2004. Modifying unwarranted variations in health care: Shared decision making using patient decision aids. Health Affairs (suppl. var):VAR 63–71. O’Connor, A., J. Wennberg, F. Légaré, H. Llewellyn-Thomas, B. Moulton, K. Sepucha, A. Sodano, and J. King. 2007. Toward the “tipping point”: Decision aids and informed patient choice. Health Affairs 26(3):716–725. Ottawa Hospital Research Institute. Decision aid library inventory. http://decisionaid.ohri.ca (accessed October 25, 2013). Pass, M., J. Belkora, D. Moore, S. Volz, and K. Sepucha. 2012. Patient and observer ratings of physician shared decision making behaviors in breast cancer consultations. Patient Education and Counseling 88(1):93–99. Patient-Centered Primary Care Collaboration. 2007. Joint principles of the patient-centered medical home. 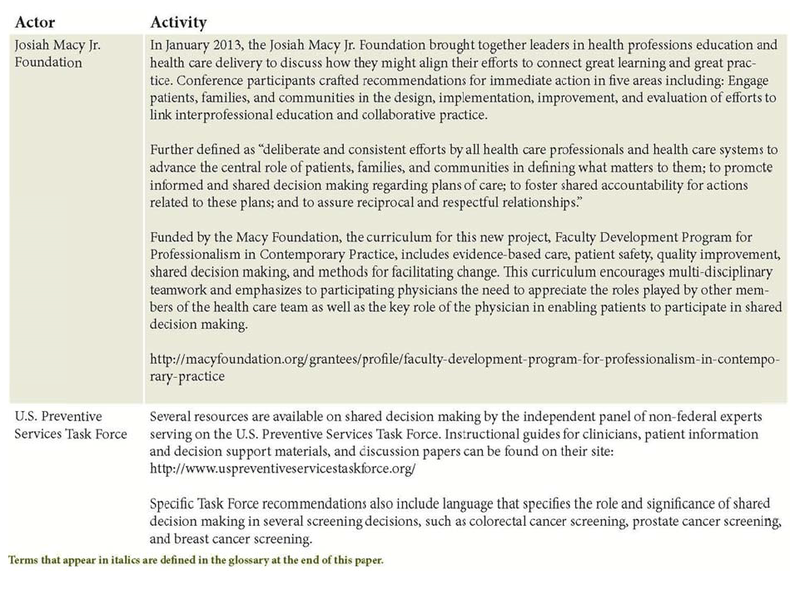 www.pcpcc.net/content/joint-principles-patient-centered-medical-home (accessed October 22, 2012). Pope, T. and H. Hexum. 2013. Legal briefing: Shared decision making and patient decision aids. Journal of Clinical Ethics 24(1):70–80. President’s Commission. 1982. Making health care decisions: A report on the ethical and legal implications of informed consent in the patient-practitioner relationship. 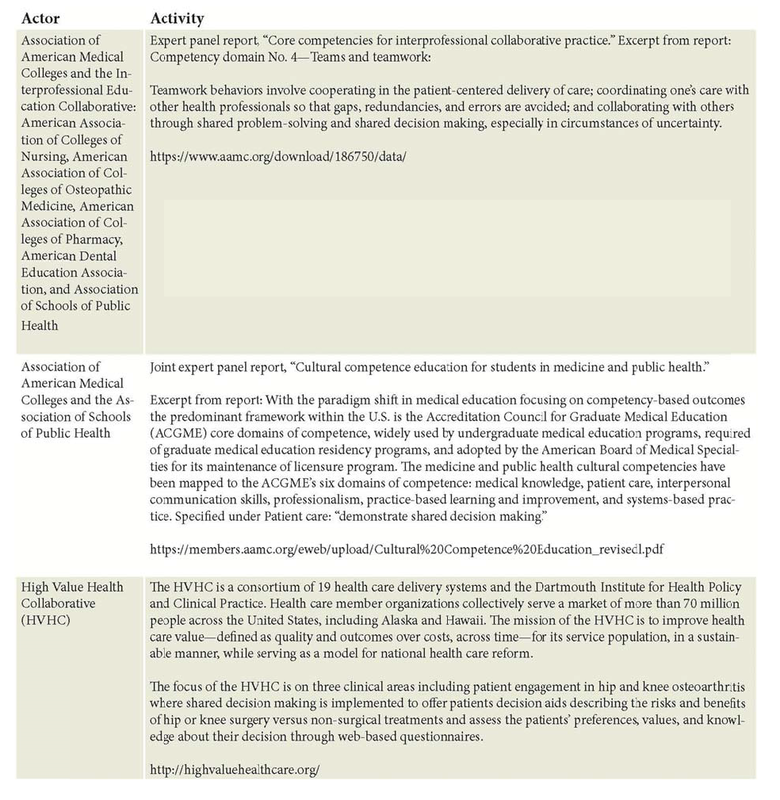 https://bioethicsarchive.georgetown.edu/pcbe/reports/past_commissions/making_health_care_decisions.pdf (accessed March 24, 2014). Rich, P. 2013. Growing an informed consumer: Shared decision-making and the use of patient decision aids. Benefit Manager Guide. Washington, DC: National Business Group on Health. Schoen, C., S. Guterman, A. Shih, J. Lau, S. Kasimow, A. Gauthier, and K. Davis. 2007. Bending the curve: Options for achieving savings and improving value in U.S. health spending. Commonwealth Fund. December. Scholl, I., M. Koelewijn-van Loon, K. Sepucha, G. Elwyn, F. Légaré, M. Härter, and J. Dirmaier. 2011. Measurement of shared decision making: A review of instruments. Zeitschrift für Evidenz, Fortbildung und Qualität im Gesundheitswesen 105(4):313–324. Sepucha, K., and E. Ozanne. 2010. How to define and measure concordance between patients’ preferences and medical treatments: A systematic review of approaches and recommendations for standardization. Patient Education and Counseling 78(1):12–23. Sepucha, K., A. Fagerlin, M. Couper, C. Levin, E. Singer, and B. Zikmund-Fisher. 2010. How does feeling informed relate to being informed? Results from the DECISIONS study. Medical Decision Making 30:77S–84S. Sepucha, K., D. Stacey, C. Clay, Y. Chang, C. Cosenza, G. Dervin, J. Dorrwachter, S. Feibelmann, J. Katz, S. Kearing, H. Malchau, M. Taljaard, I. Tomek, P. Tugwell, and C. Levin. 2011. Decision quality instrument for treatment of hip and knee osteoarthritis: A psychometric evaluation. BMC Musculoskeletal Disorders 12(1):149. Sepucha, K., J. Belkora, Y. Chang, C. Cosenza, C. Levin, B. Moy, A. Partridge, and C. Lee. 2012a. Measuring decision quality: Psychometric evaluation of a new instrument for breast cancer surgery. BMC Medical Informatics and Decision Making (12):51. Sepucha, K., S. Feibelmann, W. Abdu , C. Clay, C. Cosenza, S. Kearing, C. Levin, and S. Atlas. 2012b. Psychometric evaluation of a decision quality instrument for treatment of lumbar herniated disc. Spine 37(18):1609–1616. Shafir, A., and J. Rosenthal. 2012. Shared decision making: Advancing patient-centered care through state and federal implementation. http://www.nashp.org/sites/default/files/shared.decision.making.companion.document.pdf. (accessed January 6, 2014). Simon, M., L. Cofta-Woerpel, V. Randhawa, P. John, G. Makoul, and B. Spring. 2010. Using the word “cancer” in communication about an abnormal pap test: Finding common ground with patient-provider communication. Patient Education and Counseling 81(1):106–112. Stacey, D., C. Bennett, M. Barry, N. Col, K. Eden, M. Holmes-Rovner, H. Llewellyn-Thomas, A. Lyddiatt, F. Légaré, and R. Thomson. 2011. Decision aids for people facing health treatment or screening decisions. Cochrane Database of Systematic Reviews (10):CD001431.pub3. Stacey, D., F. Légaré, N. Col, C. Bennett, M. Barry, K. Eden, M. Holmes-Rovner, H. Llewellyn-Thomas, A. Lyddiatt, R. Thomson, L. Trevena, J. Wu. 2014. Decision aids for people facing health treatment or screening decisions. Cochrane Database of Systematic Reviews 1:CD001431. Taljaard, M., D. McRae, C. Weijer, C. Bennett, S. Dixon, and J. Taleban. 2011. Inadequate reporting of research ethics review and informed consent in cluster randomised trials: Review of random sample of published trials. British Medical Journal 342:d2496. Taljaard, M., S. Chaudhry, J. Brehaut, C. Weijer, R. Boruch, and A. Donner. 2014. Survey of consent practices in cluster randomized trials: Improvements are needed in ethical conduct and reporting. Clinical Trials 11(1):60–69. Weidmer, B., C. Brach, M. Slaughter, and D. Hays. 2012. Development of items to assess patients’ health literacy at hospitals for the Consumer Assessment of Healthcare Providers and Systems (CAHPS) hospital survey. Medical Care 50(9, suppl. 2):S12–S21. Weijer, C., J. Grimshaw, M. Taljaard, A. Binik, R. Boruch, and J. Brehaut. 2011. Ethical issues posed by cluster randomized trials in health research. Trials 12:100. Wennberg, J. 2010. Tracking medicine: A researcher’s quest to understand health care. New York: Oxford University Press. Wennberg, J. 2014. Forty years of unwarranted variation: And still counting. Health Policy S0168- 8510(13)00307-2 144(1):1-2. Wyatt, K., M. Branda, R. Anderson, L. Pencille, V. Montori, E. Hess, H. Ting, and A. Leblanc. 2014. Peering into the black box: A meta-analysis of how clinicians use decision aids during clinical encounters. Implementation Science 9(1):26. Wynia, M. 2012. Making it easier to do the right thing: A modern communication QI agenda. Patient Education and Counseling 88(3):364–366. Zikmund-Fisher, B., M. Couper, E. Singer, C. Levin, F. Fowler, S. Ziniel, P. Ubel, and A. Fagerlin. 2010a. The DECISIONS study: A nationwide survey of United States adults regarding 9 common medical decisions. Medical Decision Making 30(5 Suppl):20S-34S. Zikmund-Fisher, B., M. Couper, E. Singer, P. Ubel, F. Fowler, C. Levin, S. Ziniel, and A. Fagerlin. 2010b. Deficits and variations in patients’ experience with making 9 common medical decisions: The DECISIONS survey. Medical Decision Making 30:85S–95S. Chuck Alston is Senior Vice President; Director, Public Affairs, with Qorvis MSLGROUP. Glyn Elwyn is Professor and Senior Scientist, with Dartmouth Center for Health Care Delivery Science. Floyd J. Fowler Jr. is Scientific Senior Advisor with Informed Medical Decisions Foundation Healthwise. Leslie Kelly Hall is Senior Vice President, Policy with Healthwise. Ben Moulton is Senior Vice President with Informed Medical Decisions Foundation Healthwise. Lyn Paget is Managing Partner with Health Policy Partners. Brenna Haviland Shebel is Director, Institute on Health Care Costs and Solutions with National Business Group on Health. Zackary D. Berger is Assistant Professor, Division of General Internal Medicine, with Johns Hopkins School of Medicine. Shannon Brownlee is Senior Vice President with Lown Institute. Victor M. Montori is Director, Shared Decision Making National Resource Center with Mayo Clinic. Richard Singerman is Adjunct Assistant Professor, Division of Health Sciences Informatics with Johns Hopkins School of Medicine. Jim Walker is Principal Healthcare Informatician with Siemens Healthcare. Matthew K. Wynia is Director, Patient and Physician Engagement for Improving Health Outcomes with the American Medical Association. Diedtra Henderson is Program Officer with Institute of Medicine. Certain of the authors have declared relevant financial relationships. Details may be found here: https://app.box.com/files/0/f/2159223478/SDM_authors%E2%80%99_COI_disclosure_forms. The authors were assisted in their efforts by the following individuals: Tiffany Cheng of University of California, Berkeley; Guilherme Del Fiol, Assistant Professor, Department of Biomedical Informatics, University of Utah; Elizabeth Johnston, Senior Program Assistant, Institute of Medicine; Leslie Lenert, Chief Research Information Officer, Medical University of South Carolina; Valerie Rohrbach, Program Coordinator, Institute of Medicine; George Silberman, President, Cancer Policy Group, LLC; Melissa A. Simon, Vice Chair of Clinical Research, Department of Obstetrics and Gynecology, Northwestern University; Andrew Wong of University of California, Berkeley; Sophie Yang, Senior Program Assistant, Institute of Medicine; and Barret Zimmermann, Senior Program Assistant, Institute of Medicine. This individually authored perspective was developed as a contribution to the Learning Health System Series of the IOM Roundtable on Value and Science-Driven Health Care. The views expressed are those of the authors and not necessarily of the authors’ organizations or of the Institute of Medicine. The paper is intended to help inform and stimulate discussion. It has not been subjected to the review procedures of the Institute of Medicine and is not a report of the Institute of Medicine or of the National Research Council.